PORTO ALEGRE, Brazil (AP) - Karim Benzema scored twice and created a third that was confirmed by goal-line technology as France beat Honduras 3-0 Sunday in its first World Cup match. The dominant win was a relief for France, whose team of highly paid players failed to win in South Africa and was sent home in a disgrace after going on a training strike. 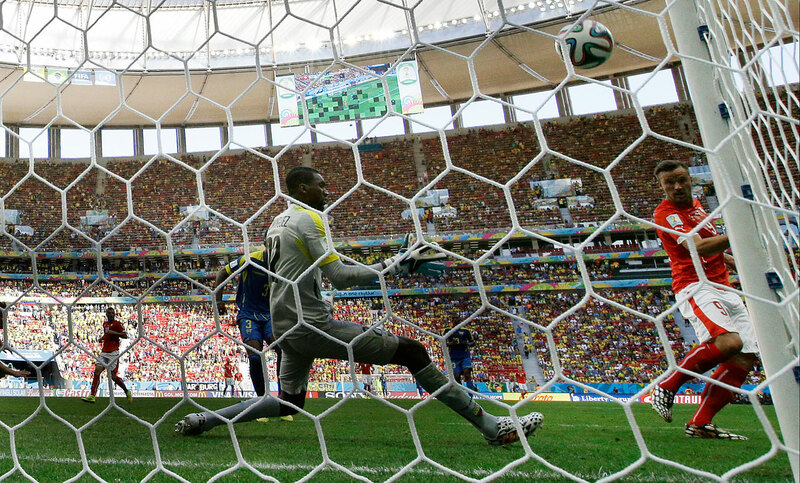 MORE: Goal-line technology confirms France goal; The right call? 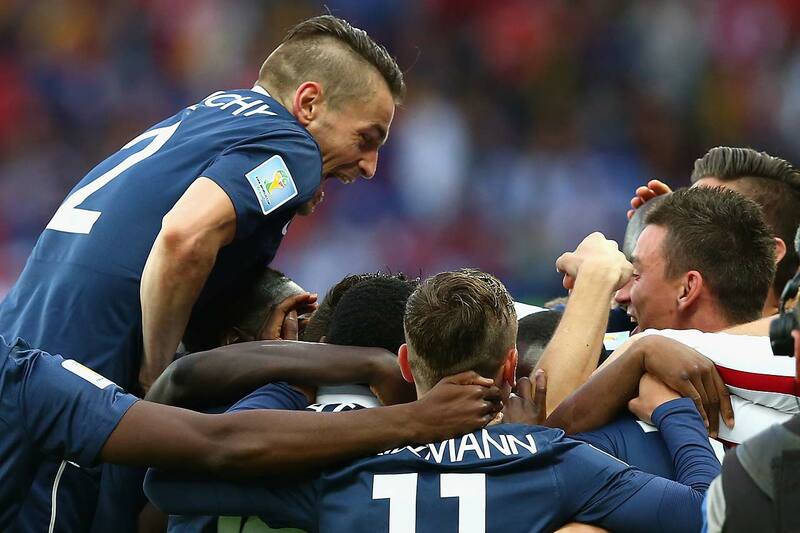 France dominated the match from the opening whistle, despite a series of scrappy tackles by the Honduran team seeking its first World Cup win. Benzema's first goal came from the penalty spot just before halftime after Wilson Palacios was sent off with his second yellow card for charging into the back of Paul Pogba. The Real Madrid striker calmly slotted the ball to the left of Noel Valladares to give Les Bleus a deserved lead going into the break. With Honduras down to 10 men, France continued to dominate and Benzema created the second goal in the 48th minute - the first to be confirmed by goal-line technology at the World Cup. Benzema latched onto a long ball by Yohan Cabaye and his shot hit the post and came back across goal before Valladares fumbled it over his own line. With the new technology system confirming the ball crossed the line, referee Sandro Ricci gave the own goal despite Honduran protests. Benzema scored his second in the 72nd, firing in powerfully from inside the area after a long range shot by right back Mathieu Debuchy was blocked. French keeper Hugo Lloris didn't have to touch the ball until the 31st minute and didn't have to make a save all night. France looked dangerous from the start, with Blaise Matuidi and Antoine Griezmann both hitting the crossbar before the half-hour mark. 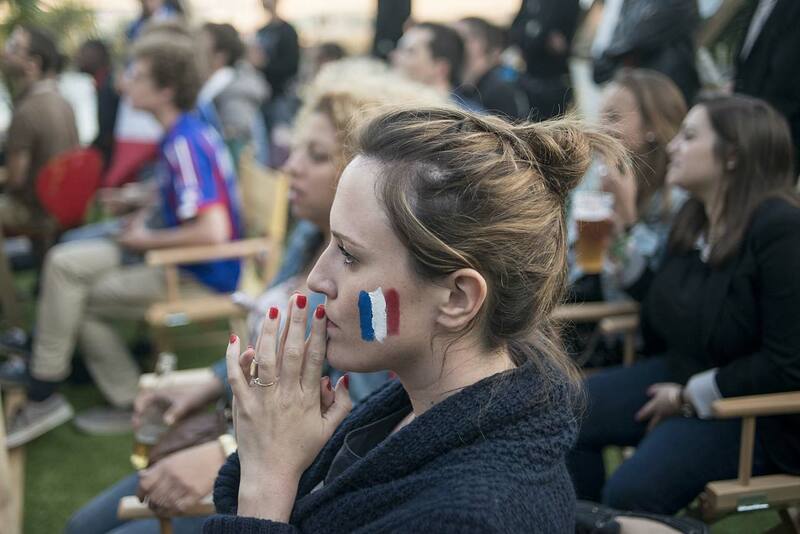 The only downside for the French fans was that the teams' national anthems weren't played before the game because of an apparent malfunction - meaning they didn't get a chance to sing ''La Marseillaise.'' FIFA did not immediately give an explanation to why the anthems weren't played. 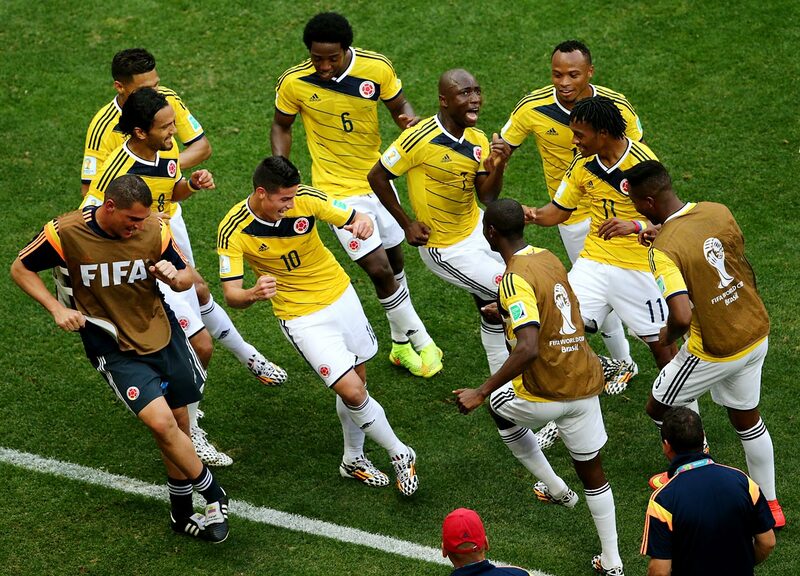 James Rodriguez (10) of Colombia and teammates dance and celebrate after Rodriguez notches his team's first goal during the Group C match between Colombia and Cote D'Ivoire. 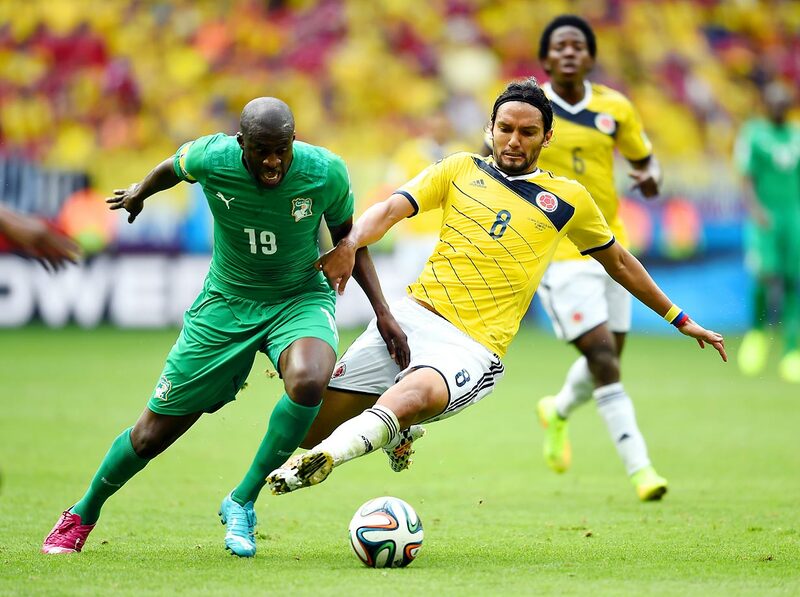 Yaya Toure of the Ivory Coast and Abel Aguilar of Colombia compete for the ball during the Group C match between Colombia and Cote D'Ivoire. 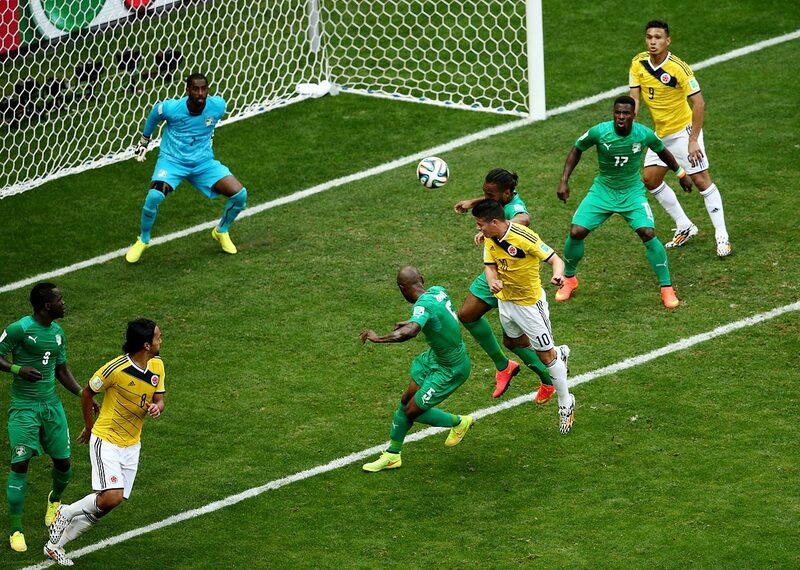 James Rodriguez of Colombia scores his team's first goal of the match past goalkeeper Boubacar Barry of the Ivory Coast on a header. 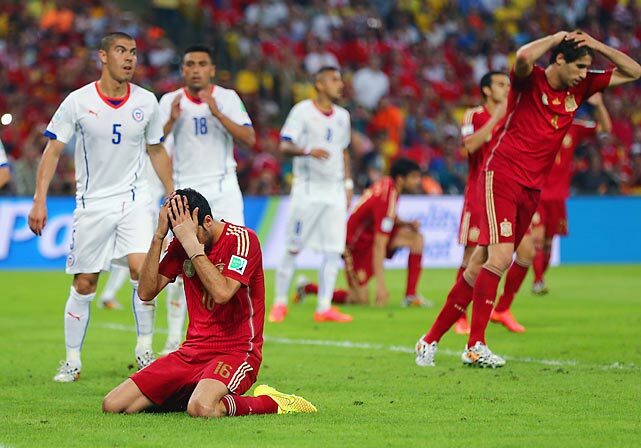 Sergio Busquets of Spain reacts after a missed chance in his team's disappointing loss to Chile. 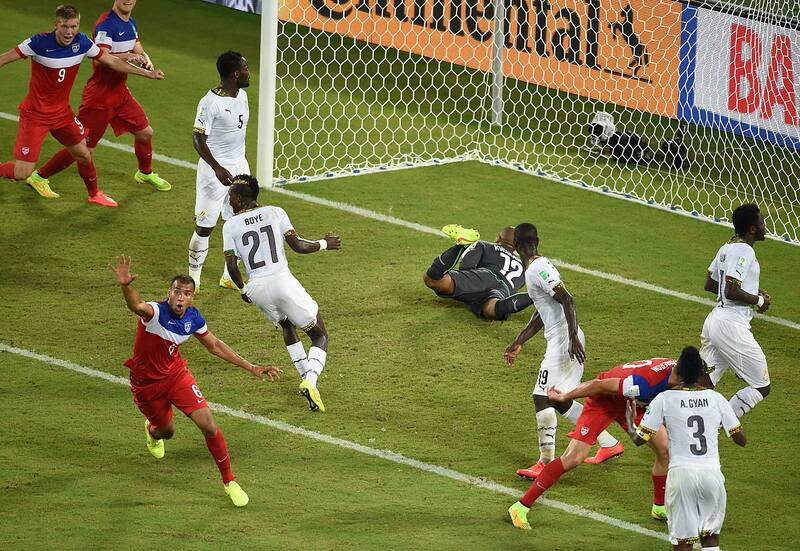 The defeat knocked the defending World Cup champions out of the running to advance to the next round. Eduardo Vargas of Chile scores the team's first goal past goalkeeper Iker Casillas of Spain in the 2-0 Chile victory. 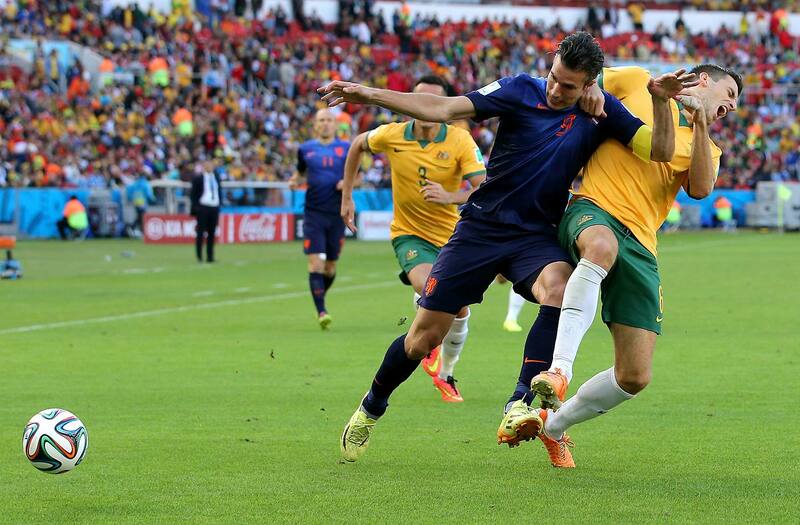 Robin Van Persie of the Netherlands and Matthew Spiranovic of Australia battle for the ball during a 3-2 win by the Netherlands. Memphis Depay of the Netherlands jumps into teammates' arms in celebration after scoring the team’s third goal in the group B match. 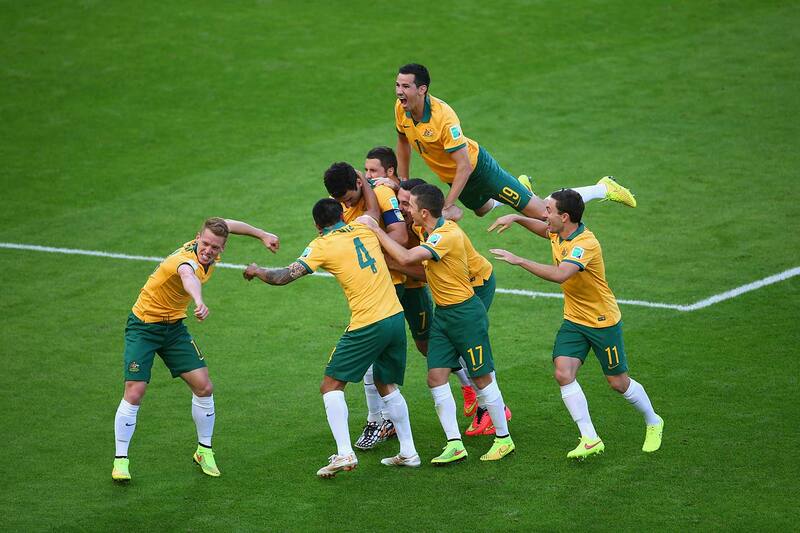 Mile Jedinak of Australia celebrates with his teammates after scoring Australia’s second goal of the Group B match against the Netherlands. Lee Keun-Ho of South Korea celebrates after scoring the team's first and only goal in a tie with Russia. Russia's forward Alexander Kerzhakov scores during the 1-1 draw with South Korea in the Pantanal Arena in Cuiaba. 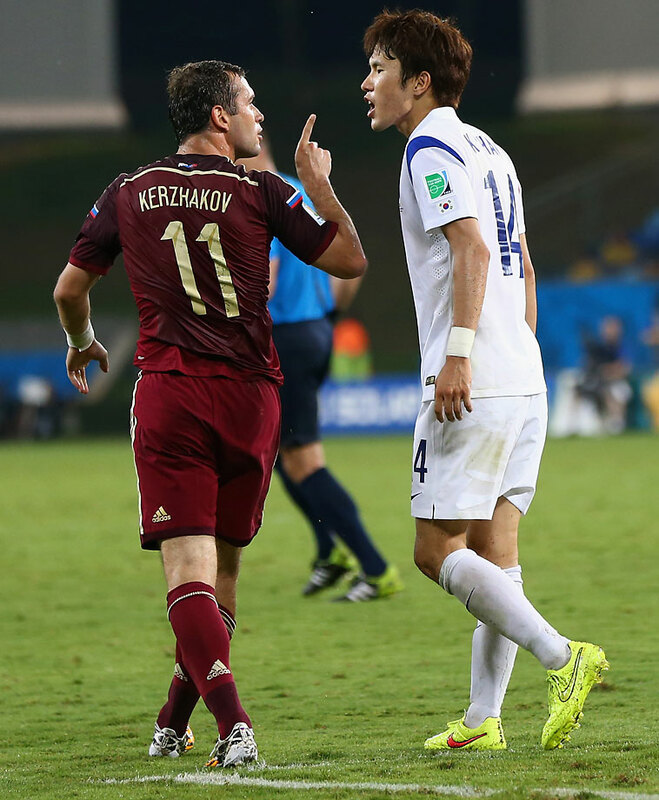 Aleksandr Kerzhakov and Han Kook-Young exchange words during their match on June 17. Neymar of Brazil and Francisco Javier Rodriguez of Mexico battle for the ball during the Group A match resulting in a 0-0 draw. 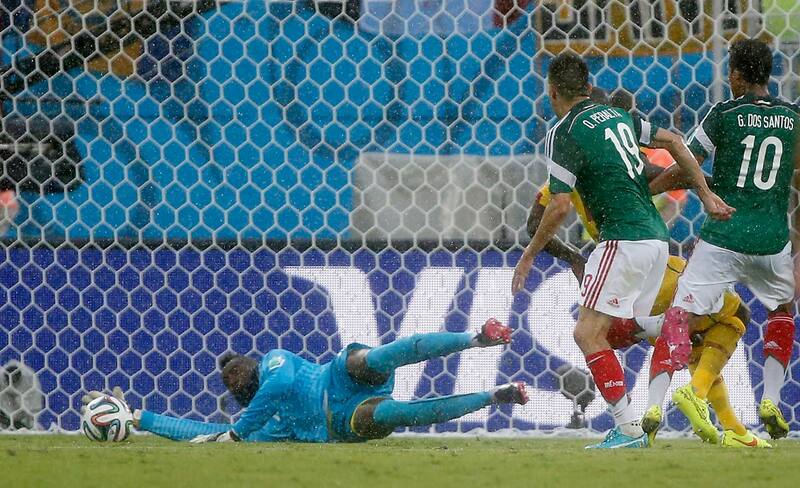 Goalkeeper Guillermo Ochoa of Mexico saves header attempt by Thiago Silva of Brazil during the Group A match. 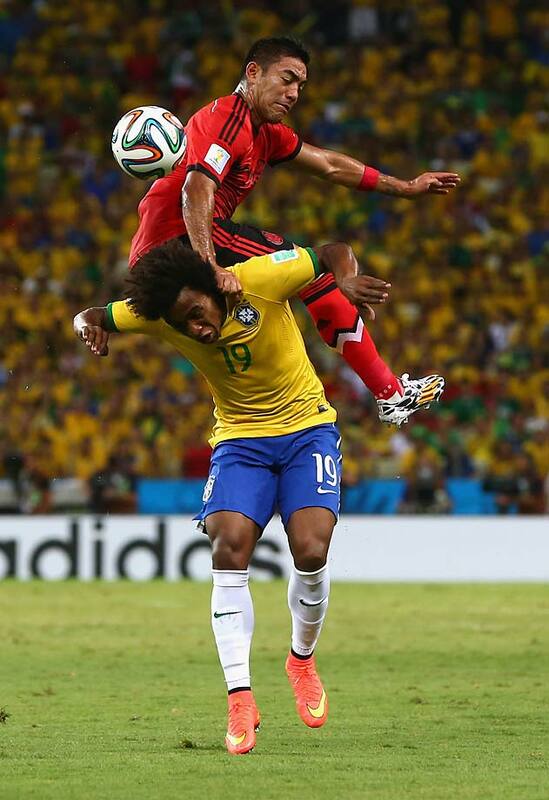 Marco Fabian of Mexico challenges Willian of Brazil resulting in a foul against the Mexican player. 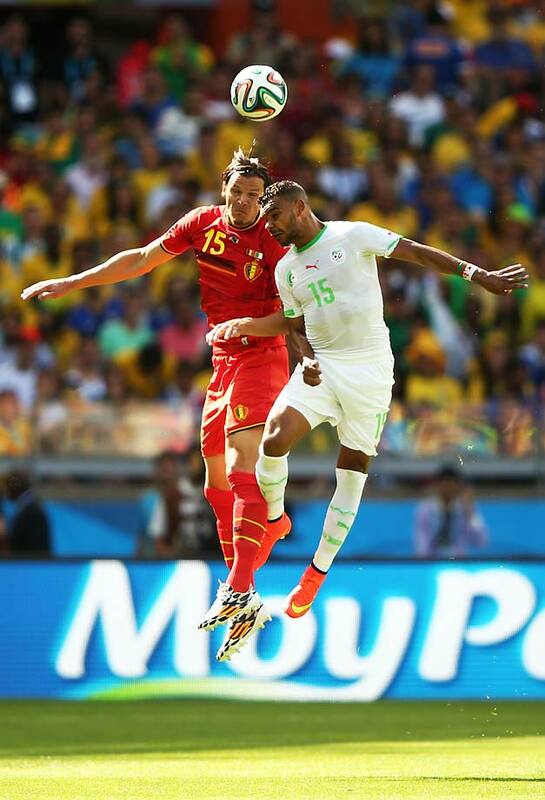 Daniel Van Buyten of Belgium and El Arbi Hillel Soundani of Algeria battle to win a header during their opening match of the World Cup 2014. 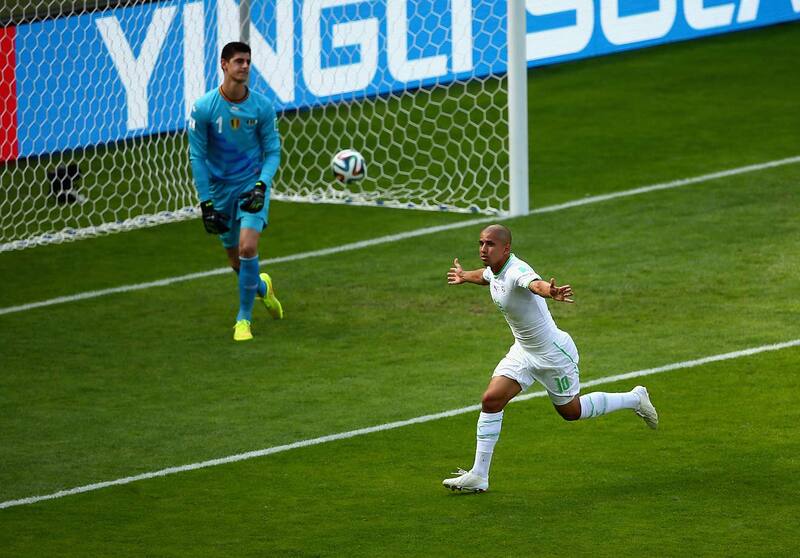 Sofiane Feghouli of Algeria scores the first goal of the Group H match between Algeria and Belgium off of a penalty kick in the first half. 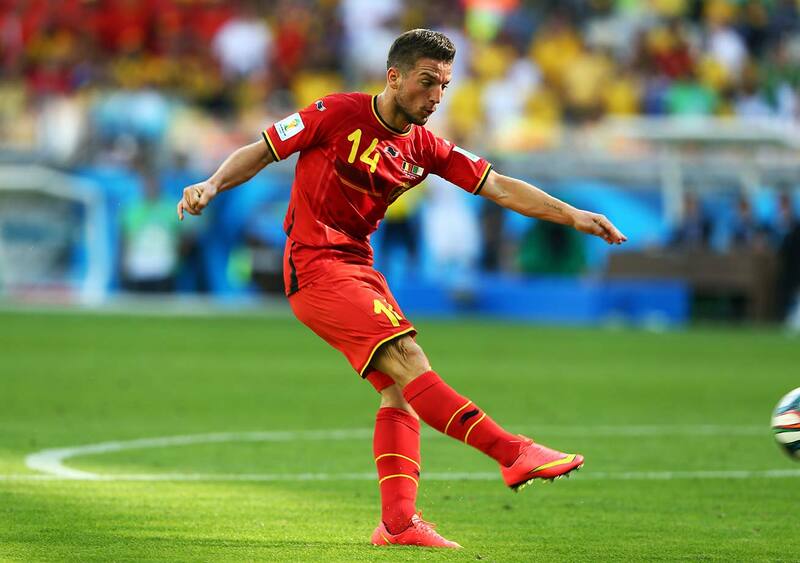 Dries Mertens of Belgium scores the winning goal of the Group H match between Belgium and Algeria putting Belgium ahead 2-1. 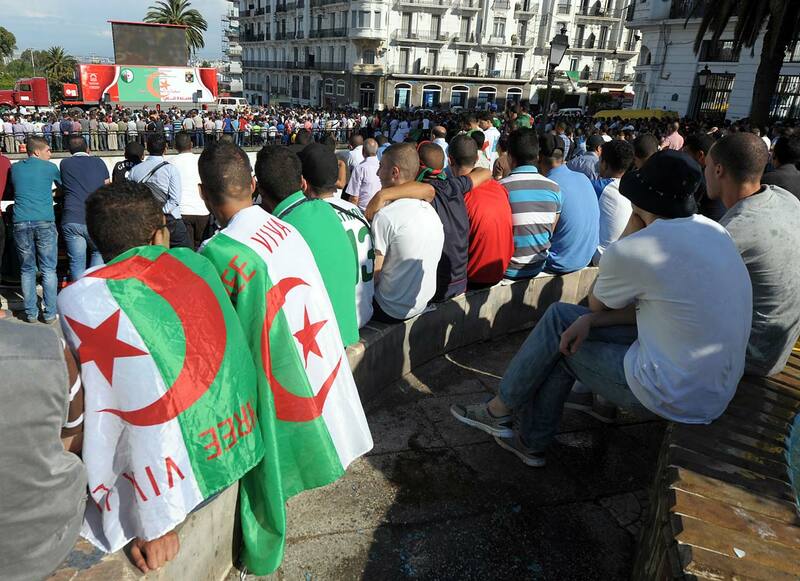 Algerian fans gather outside of the central post office building in Algiers to watch the match between Algeria and Belgium. John Brooks reacts after scoring the game winner on a header in the 86th minute of a 2-1 U.S. victory over Ghana, the team that had knocked the Americans out of the previous two World Cups. 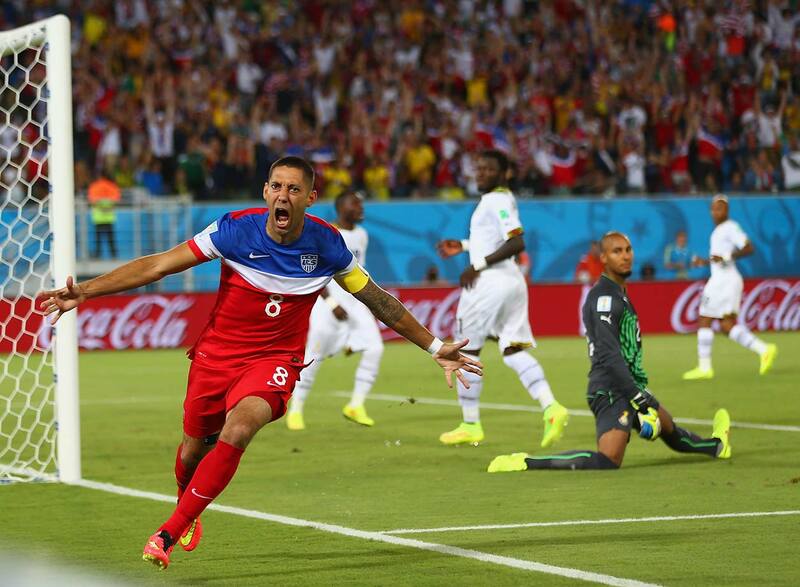 Clint Dempsey scored 34 seconds into the U.S.-Ghana match, the fastest ever scored by an American in the tournament and the sixth-fastest in World Cup history. 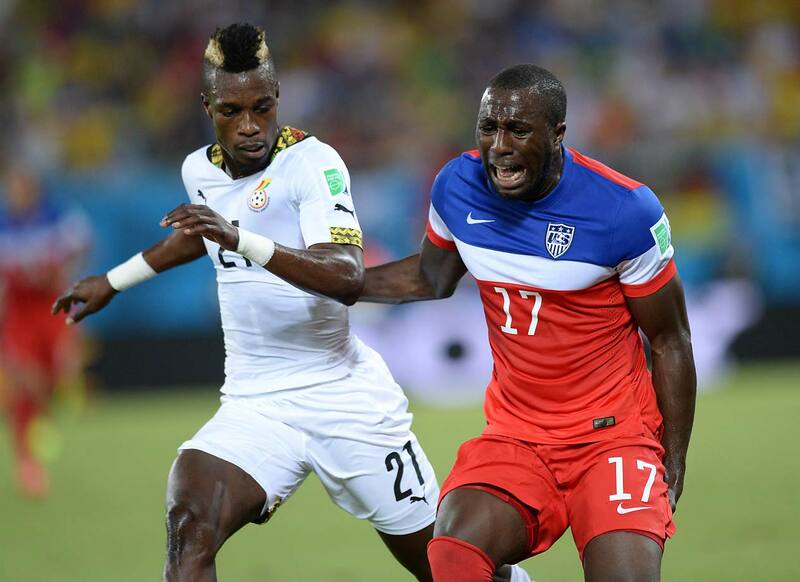 Jozy Altidore suffered a left hamstring injury when he tried to control a long ball in the 21st minute of the U.S.-Ghana match. 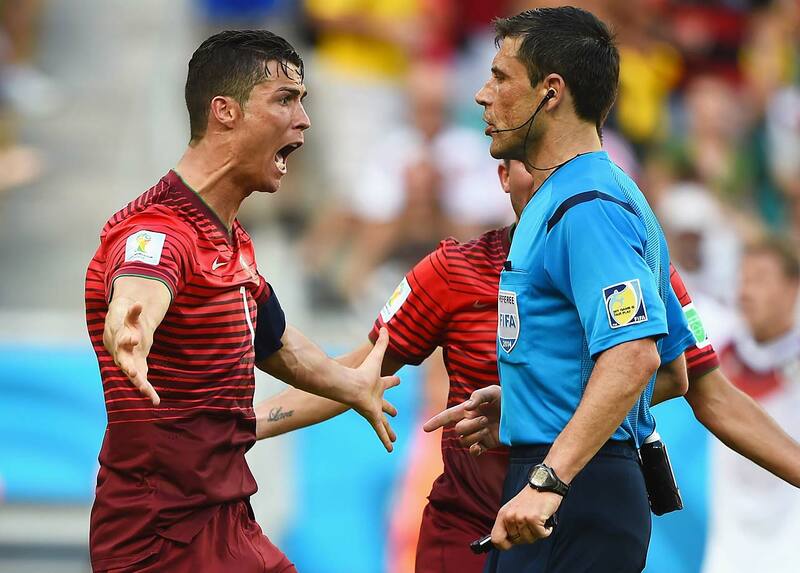 Cristiano Ronaldo, of Portugal yells at the referee during the Group G match against Germany. 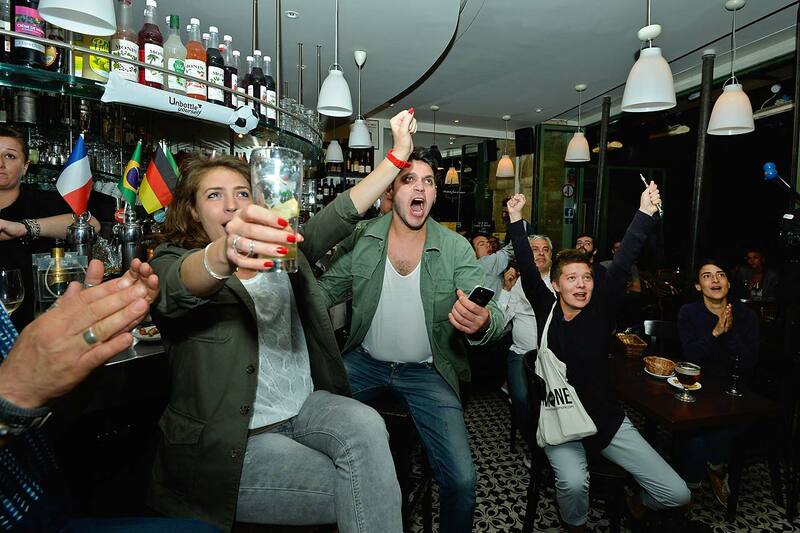 German fans gather in Berlin and celebrate as they watch Germany defeat Portugal 4-0 in their first match of the 2014 World Cup. 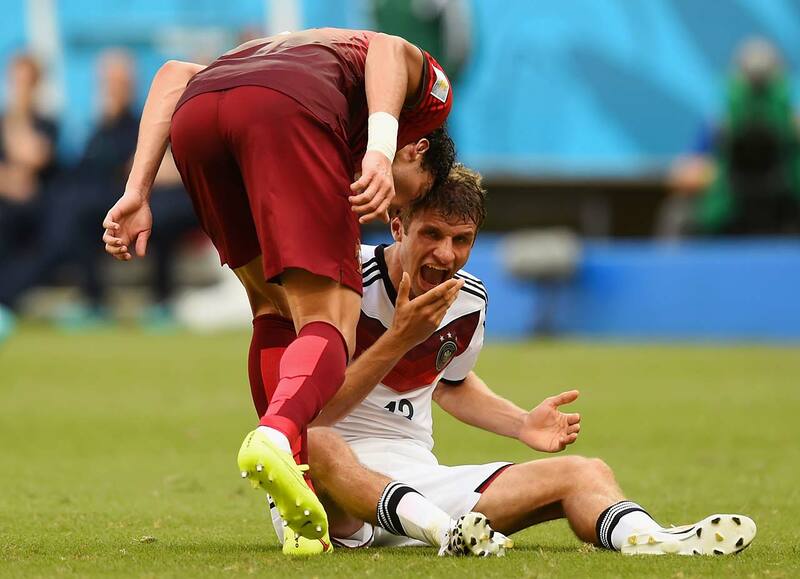 Pepe of Portugal headbutts Thomas Mueller of Germany, resulting in a red card during Portugal's 4-0 loss in a Group G match at Arena Fonte Nova on June 16. 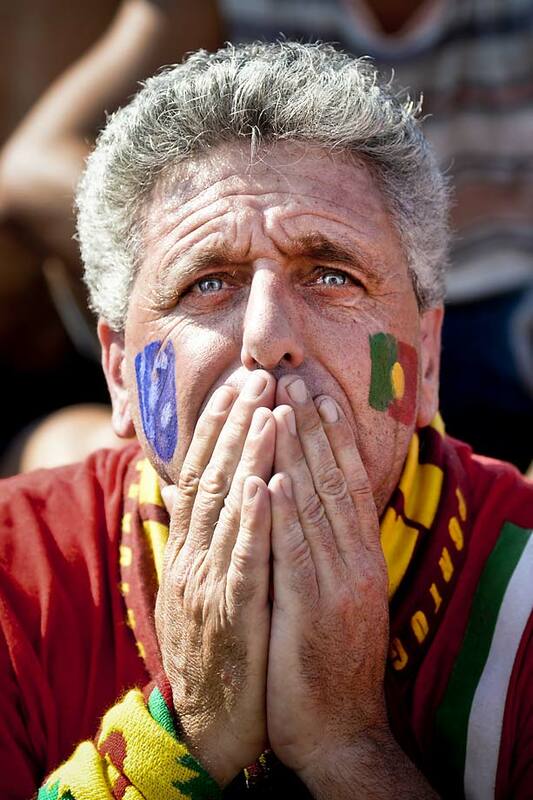 A distressed Portugal fan watches from Lisbon, as Portugal suffers a 4-0 loss against Germany. 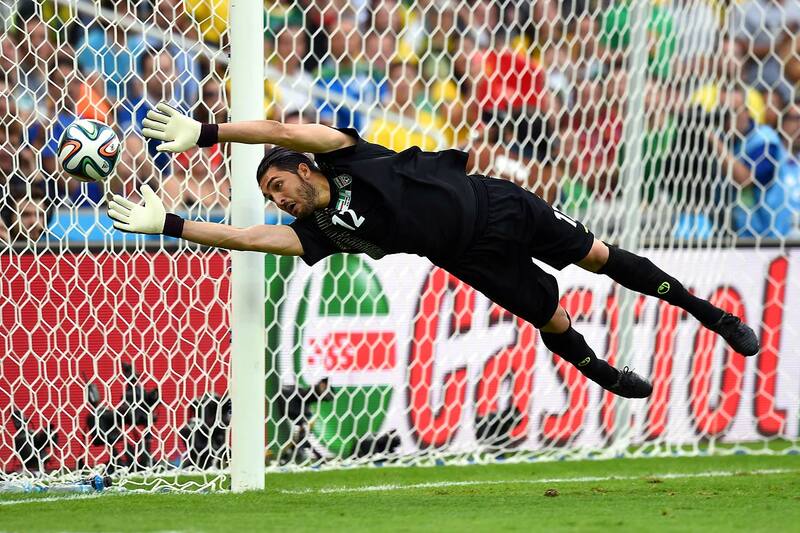 Goalkeeper, Alireza Haghighi of Iran makes diving save during the Group F match between Iran and Nigeria ending in a 0-0 draw. 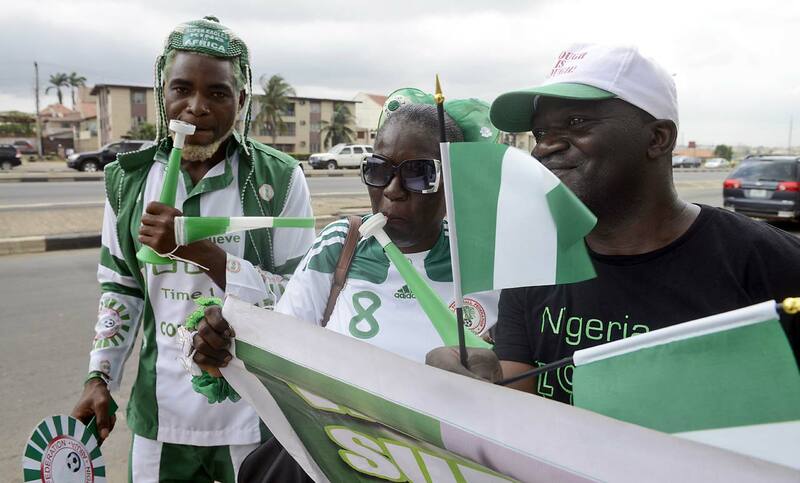 Fans in Lagos State, Nigeria prepare for Nigeria’s first game of the tournament against Iran. 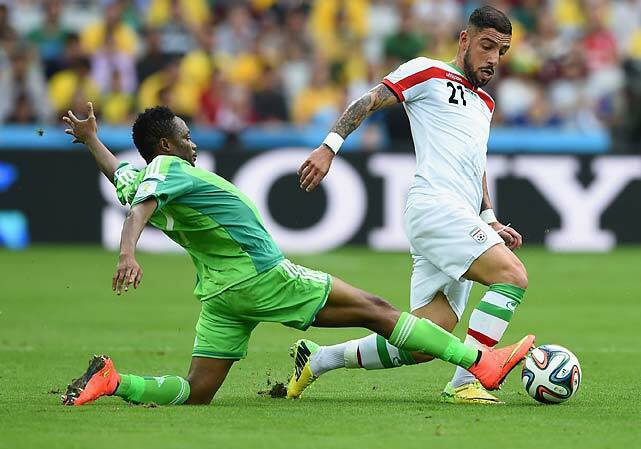 Ashkan Dejagah of Iran and Ahmed Musa of Nigeria battle for the ball during the Group F match at Arena da Baixada. 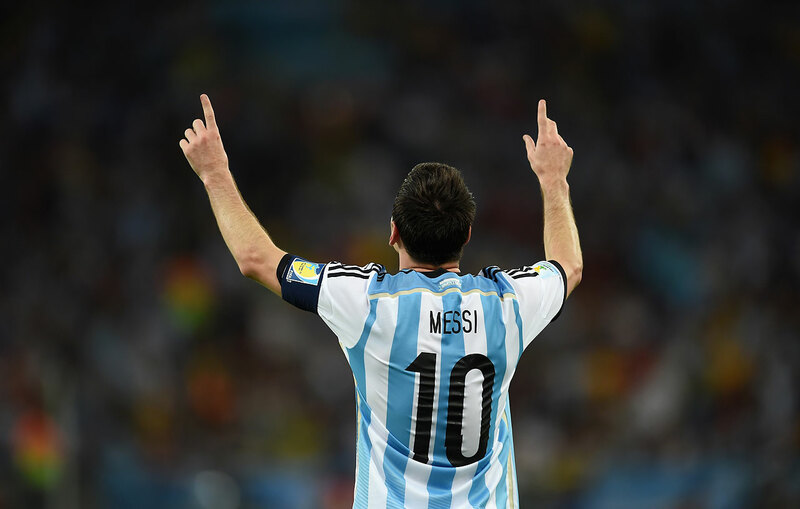 Lionel Messi of Argentina celebrates after scoring the winning goal against Bosnia-Herzegovina in Rio de Janeiro. 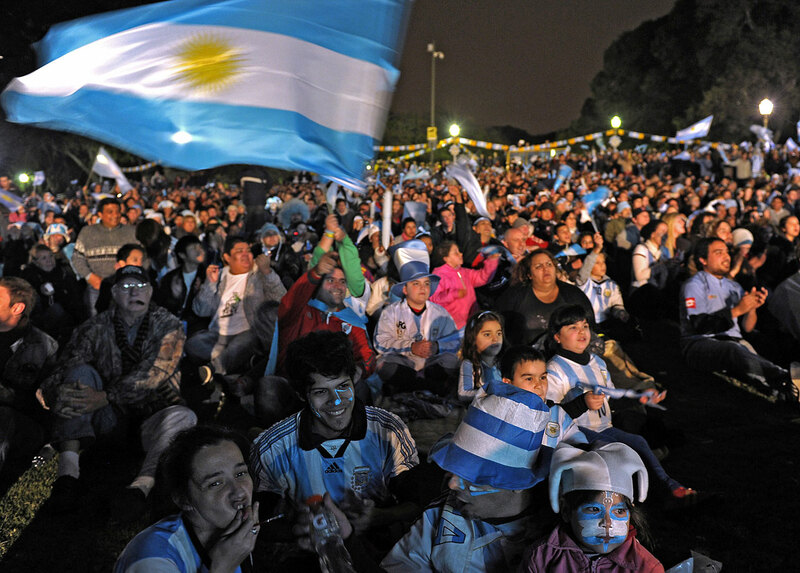 Argentinian football fans in Buenos Aires watch the match against Bosnia-Hercegovina on a giant screen at San Martin Square. 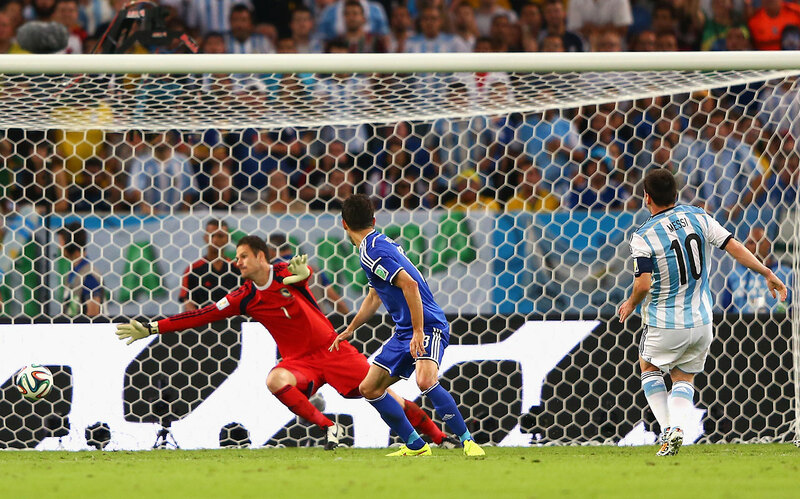 Lionel Messi of Argentina shoots and scores his team's second goal against Bosnia-Herzegovina at Maracana on June 15 in Rio de Janeiro. 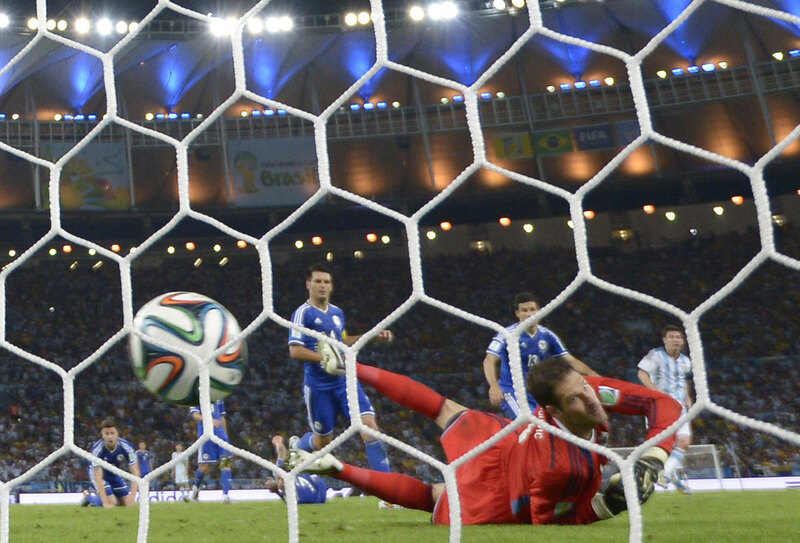 Bosnia-Hercegovina's goalkeeper Asmir Begovic fails to stop Lionel Messi's goal during a Group F football match. 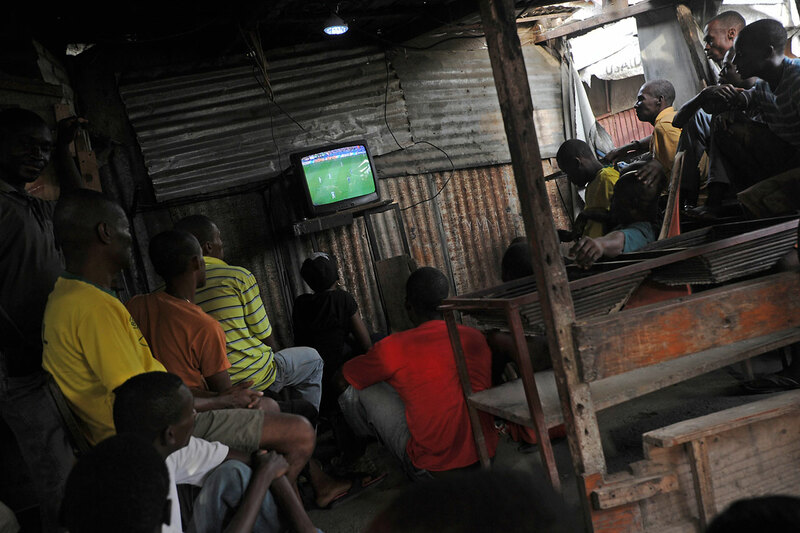 Haitians watch the match between Argentina and Bosnia-Hercegovina at Centre Kid in Christ Roi neighborhood, Port au Prince, on June 15. 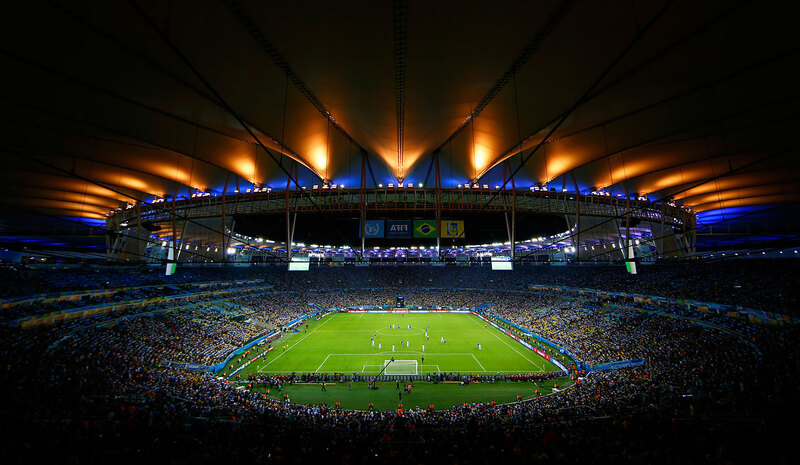 A general view of the stadium during the match between Argentina and Bosnia-Herzegovina. Switzerland's Haris Seferovic scores his side's winning goal past Ecuador's goalkeeper Alexander Dominguez in stoppage time during a 2-1 win on Sunday, June 15, at the Estadio Nacional in Brasilia, Brazil.It was the latest goal scored in a group stage game in World Cup history. 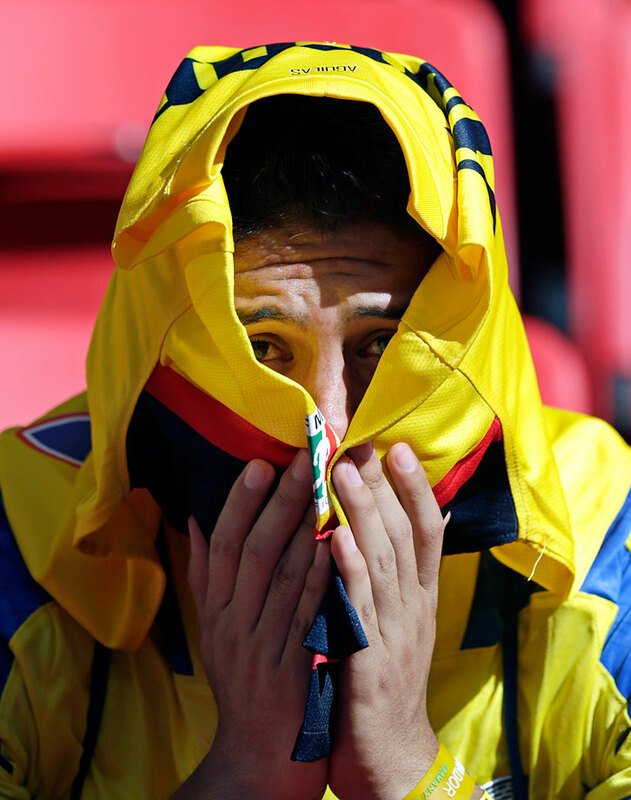 An Ecuadorean fan sits in the stands following Ecuador's 2-1 loss to Switzerland on June 15. 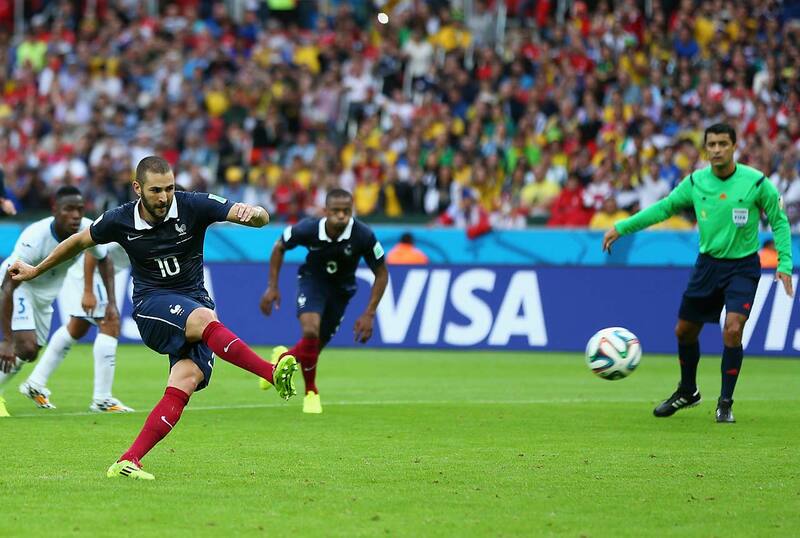 Karim Benzema of France shoots and scores his team's first goal on a penalty kick against Honduras at Estadio Beira-Rio on June 15. France won 3-0. Mathieu Debuchy (left) of France celebrates after a shot from Karim Benzema of France went in off Noel Valladares of Honduras to score an own goal against Honduras on June 15. 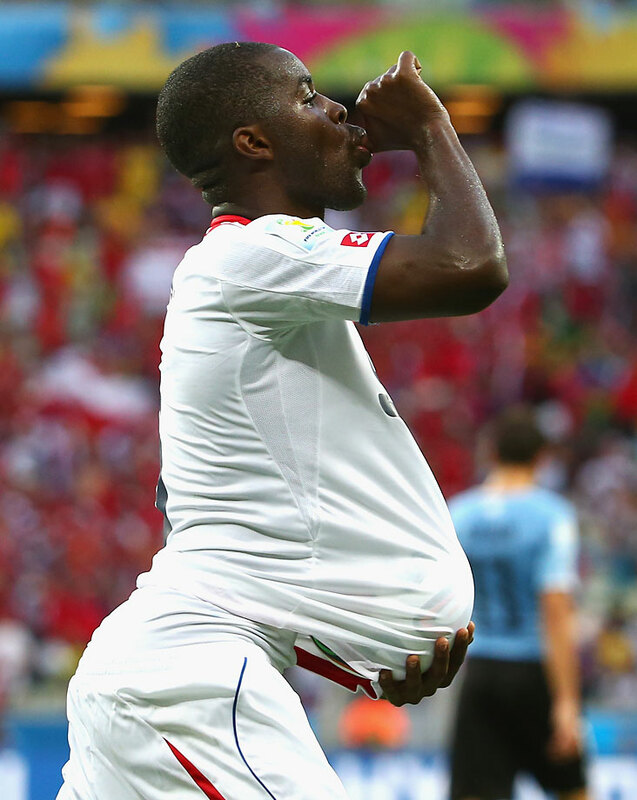 Joel Campbell of Costa Rica celebrates scoring his team's first goal with the ball under his jersey during the Group D 3-1 victory over 2010 semifinalist Uruguay. 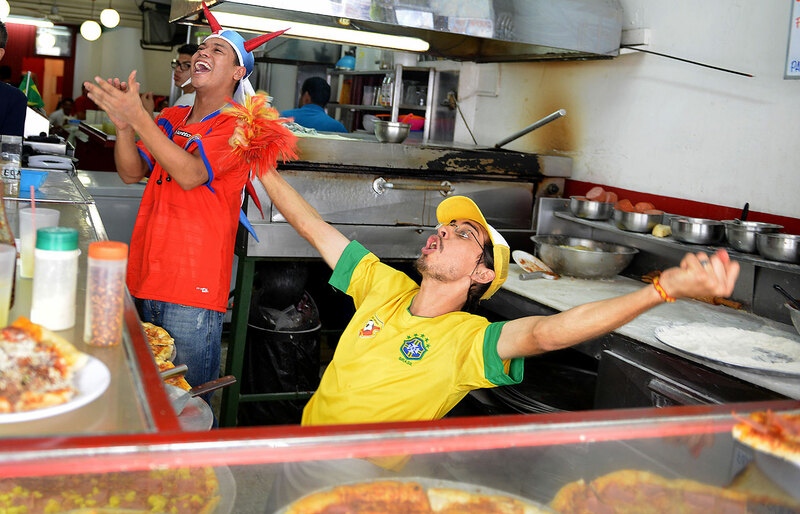 Workers at a pizza store in San Jose, Costa Rica, celebrate their team's goal against Uruguay as they watch the World Cup. 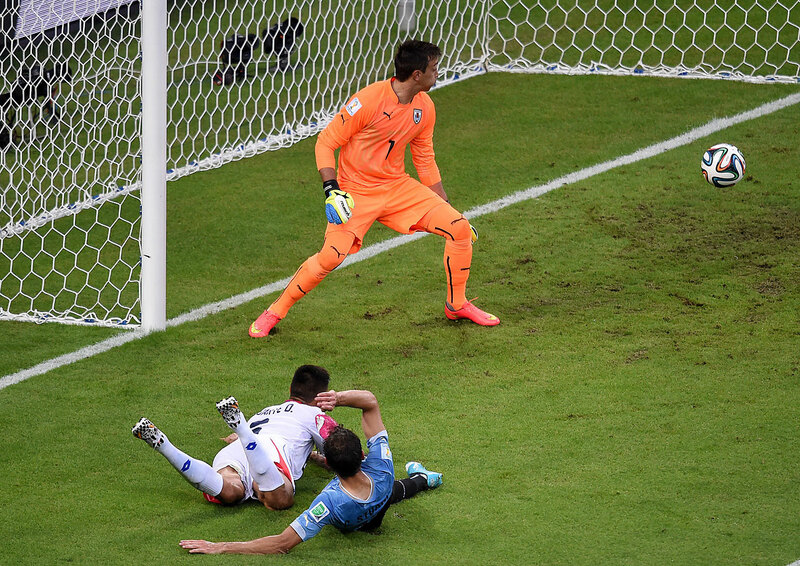 Costa Rica's defender Oscar Duarte heads the ball past Uruguay's goalkeeper Fernando Muslera to score his team's second goal during a 3-1 win over Uruguay. 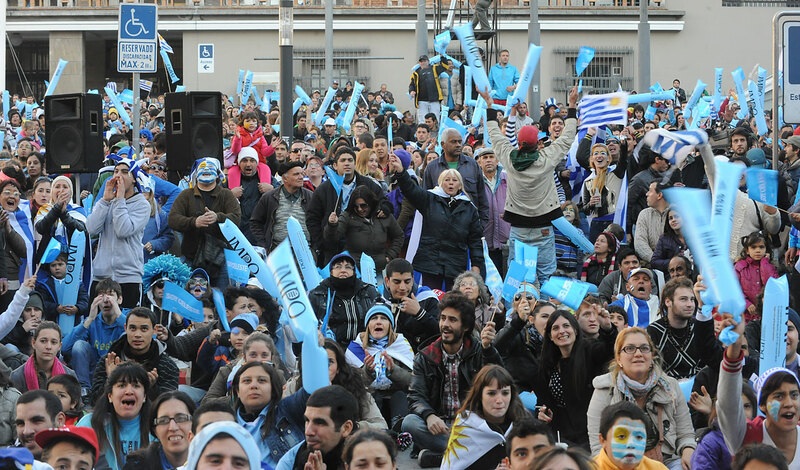 Fans in Montevideo, Uruguay, watch with disappointment the match against Costa Rica. 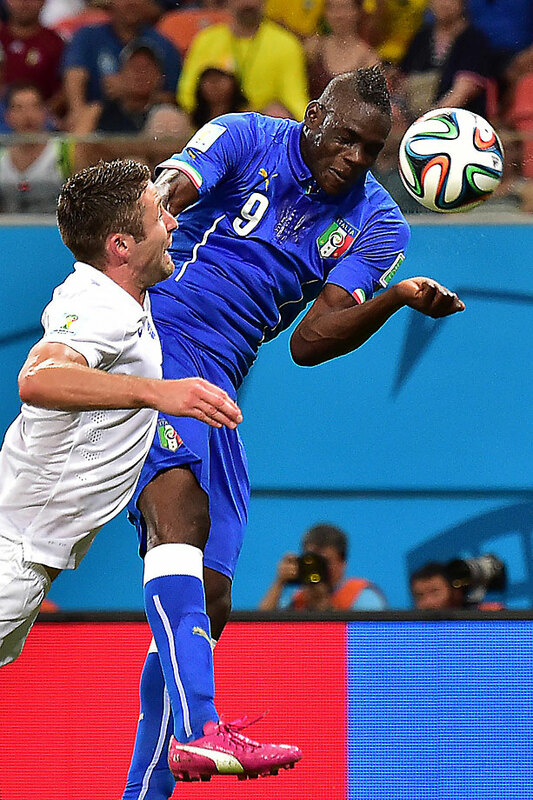 Italy's forward Mario Balotelli heads the ball to score the winning goal as England's defender Gary Cahill defends during Italy's 2-1 victory at the Amazonia Arena in Manau. 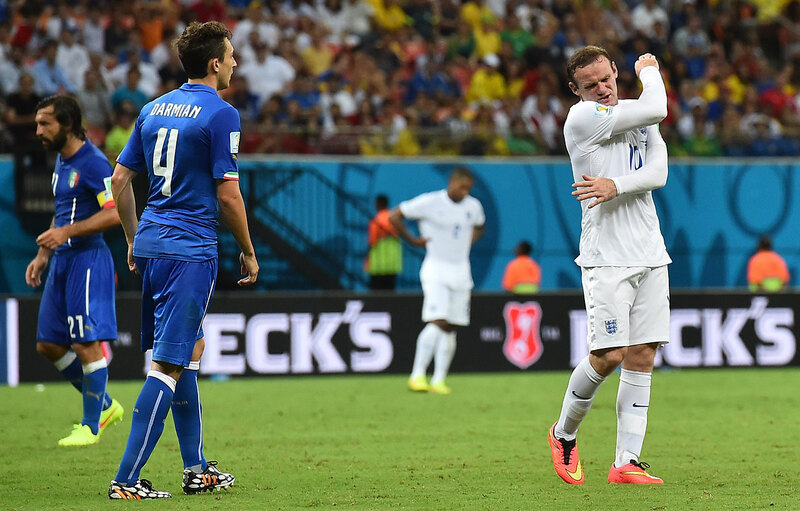 England's forward Wayne Rooney gestures after missing a shot on goal during a 2-1 loss to Italy at the Amazonia Arena in Manaus on June 14. 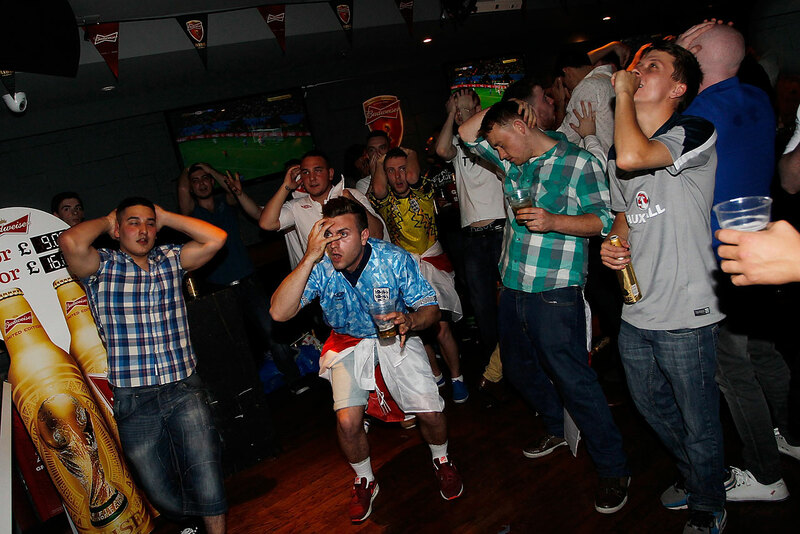 England football fans react in Riley's Sport's Bar in London as England fails to equalize against Italy in a 2-1 loss. 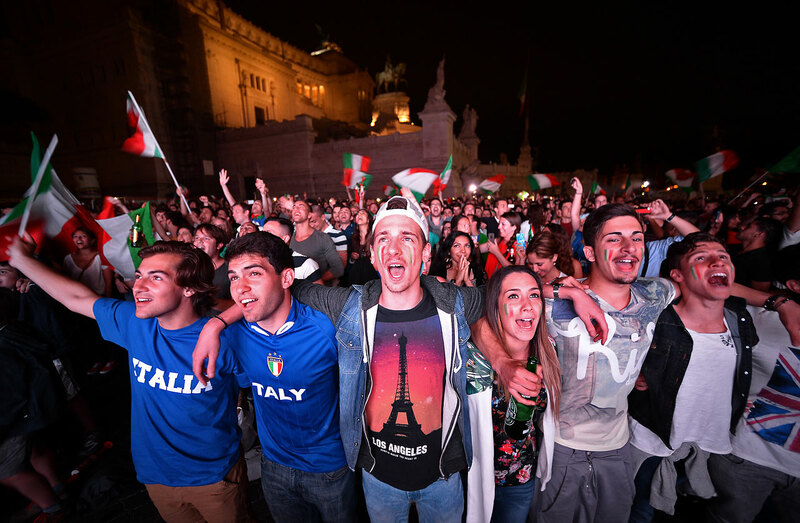 Soccer fans in Rome watch a giant screen in central Rome's Piazza Venezia as Italy defeats England 2-1. James Rodriguez of Colombia (bottom) celebrates scoring his teams third goal against Greece with Juan Guillermo Cuadrado (top) and Juan Camilo Zuniga (middle) at Estadio Mineirao on June 14. 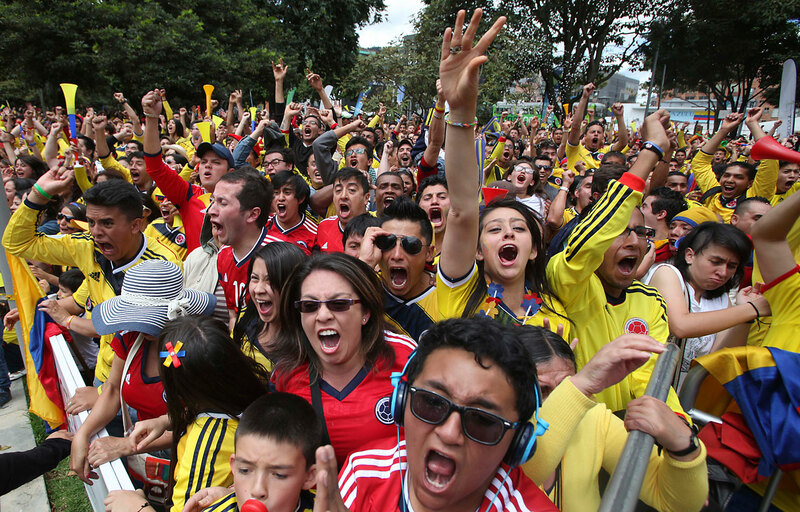 Colombia soccer fans in Bogota cheer during their team's 3-0 win over Greece on Saturday, June 14. 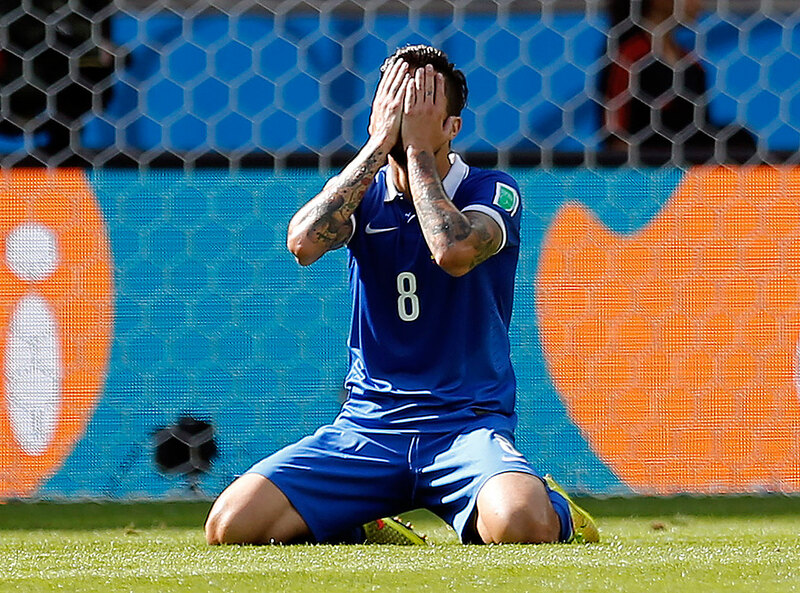 Greece's Panagiotis Kone reacts after missing a chance duringa 3-0 loss to Colombia. 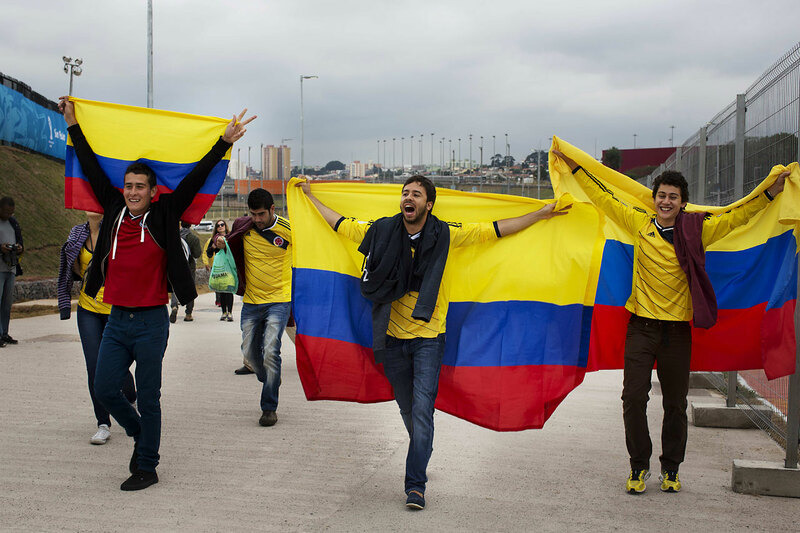 Colombia fans enjoy the atmosphere prior to the Group C match between Colombia and Greece at Estadio Mineirao on June 14. Japan's Keisuke Honda, second from right, scores the opening goal during the group C World Cup soccer match between Ivory Coast and Japan at the Arena Pernambuco in Recife, Brazil, on June 14. 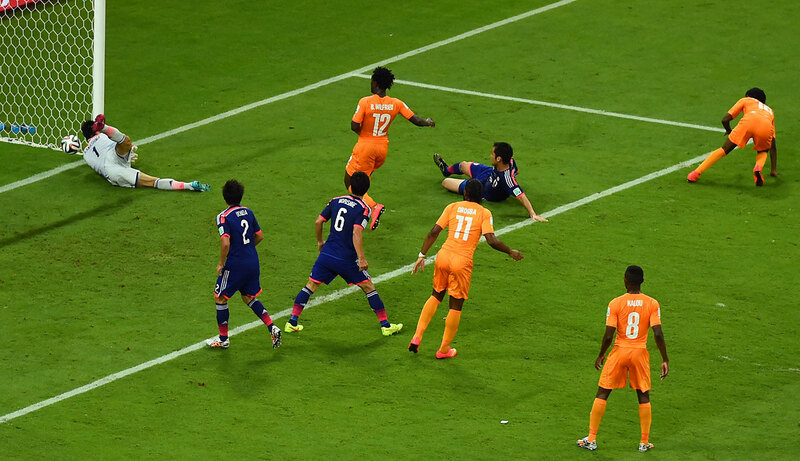 Gervinho of the Ivory Coast (right) scores his team's second goal on a header past goalkeeper Eiji Kawashima of Japan. 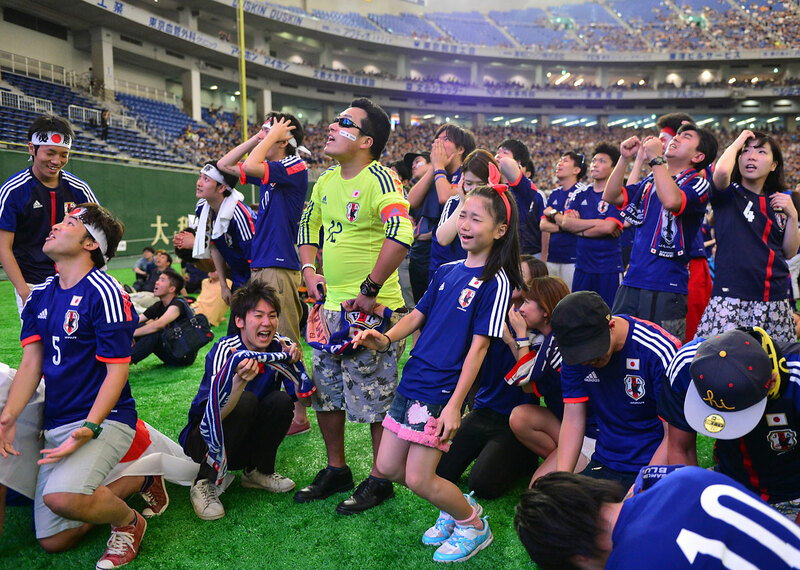 The gathering of Japan's supporters in the Tokyo Dome express their disappointment during their team's 2-1 loss to the Ivory Coast. 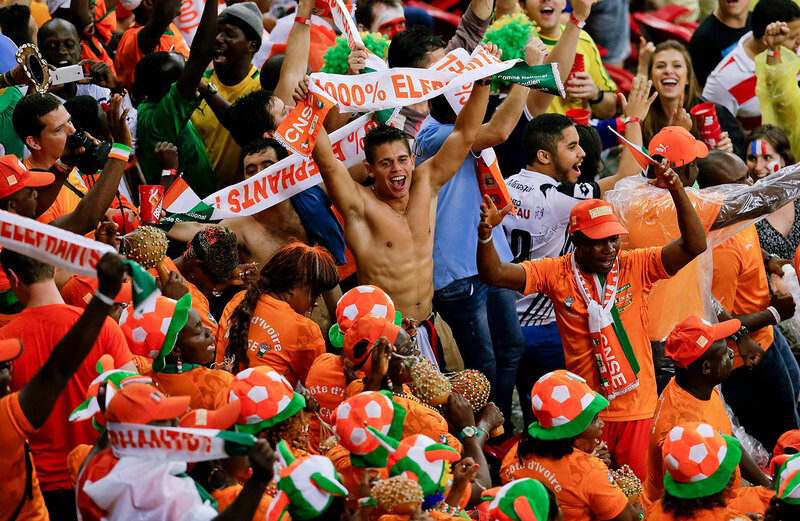 Ivory Coast fans cheer prior to their team's game against Japan. Mexico's Oribe Peralta follows up to score the only goal in Mexico's 1-0 victory over Cameroon in the Arena das Dunas in Natal on June 13. 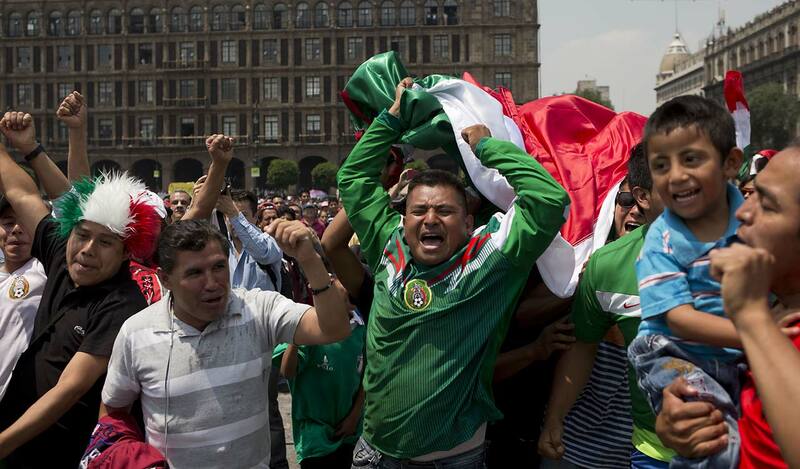 Soccer fans In Mexico City celebrate a goal by striker Oribe Peralta against Cameroon. 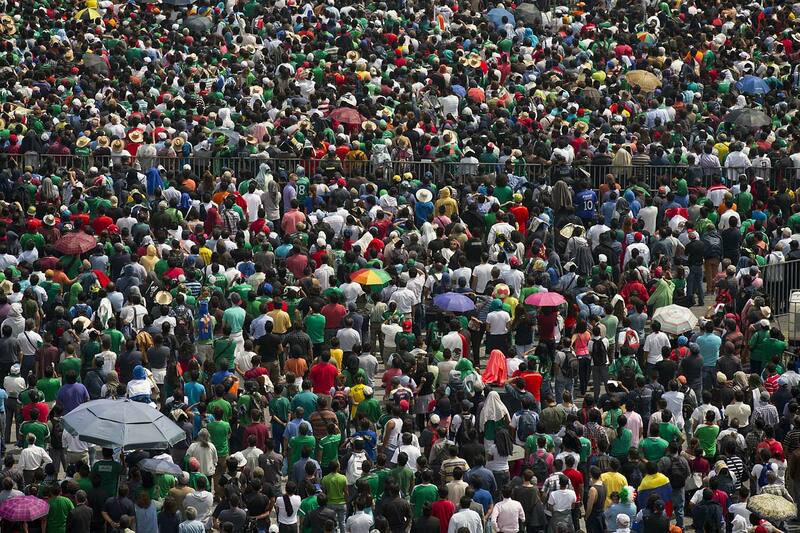 People in Mexico City's main square, the Zocalo, watch the match between El Tri and Cameroon. 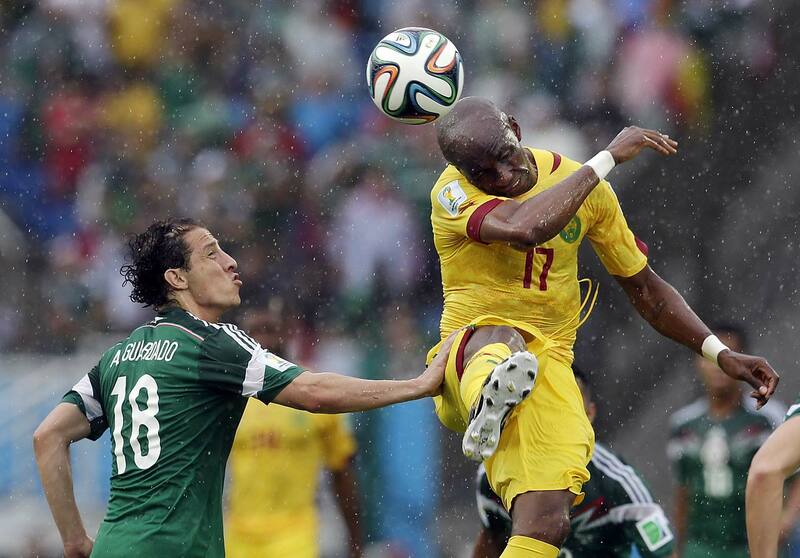 Cameroon's Stephane Mbia (17) heads the ball past Mexico's Andres Guardado during the first half of the group A World Cup soccer match between Mexico and Cameroon. 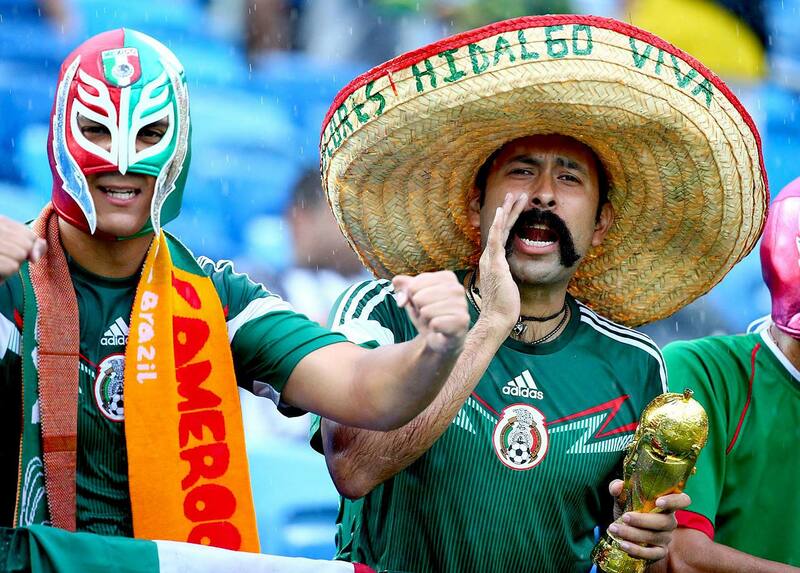 Mexico fans show their support prior to the Cameroon-Mexico game. 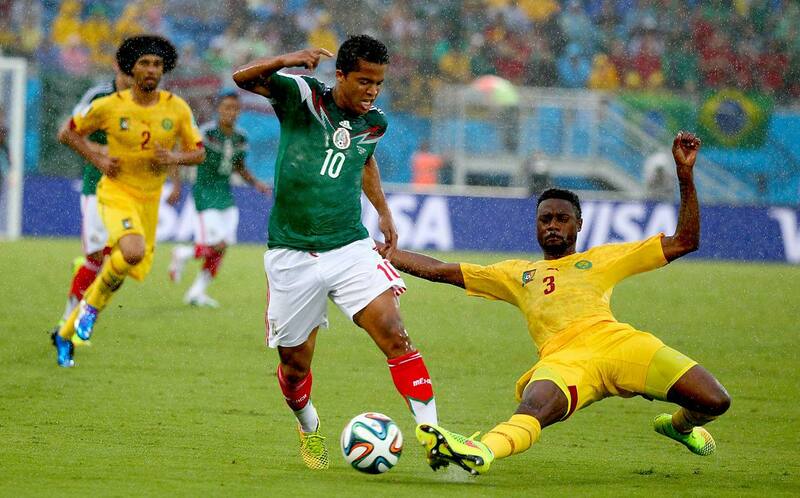 The Mexico-Cameroon game was played in a steady rain. 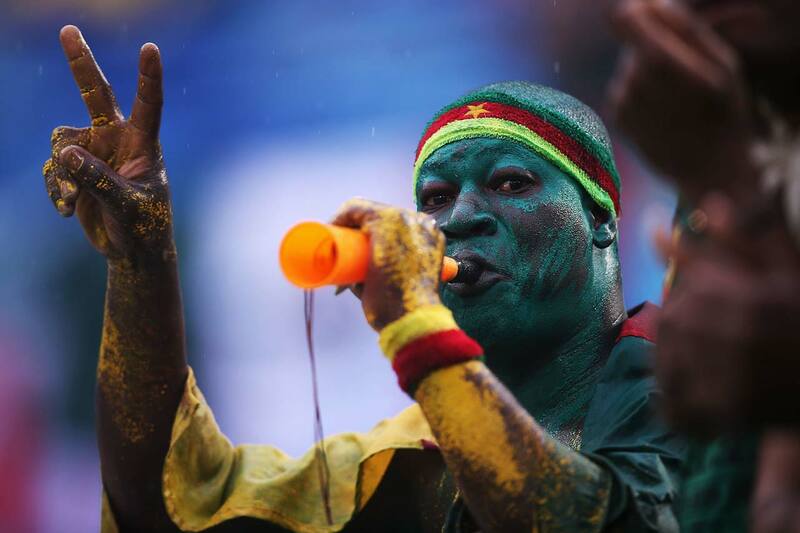 A Cameroon fan blows a horn in the rain during the match between Mexico and Cameroon. 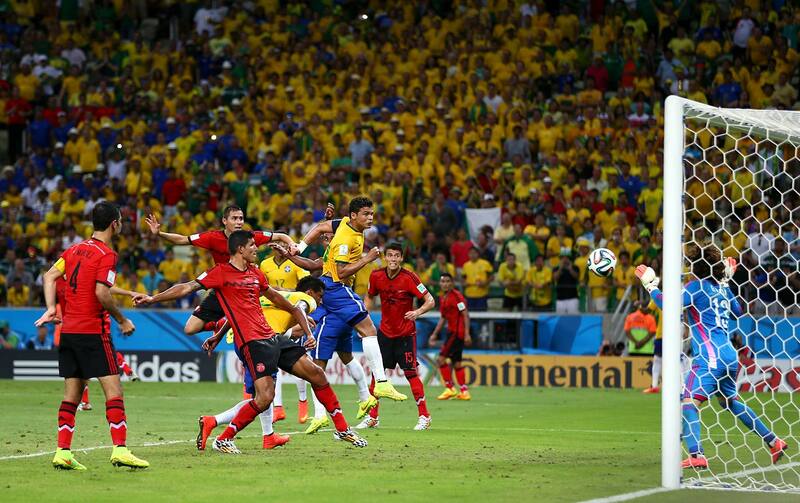 Jean Beausejour of Chile shoots and scores his team's third goal against Australia at Arena Pantanal on June 13. 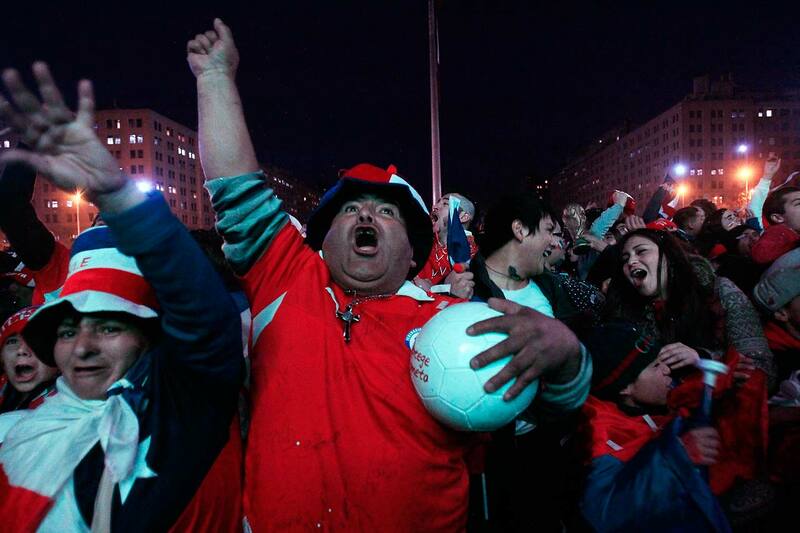 Soccer fans cheer as they watch Chile's Jorge Valdivia score the second goal of the World Cup match between Chile and Australia, via a live broadcast on a giant screen in front of La Moneda presidential palace, in Santiago, Chile. 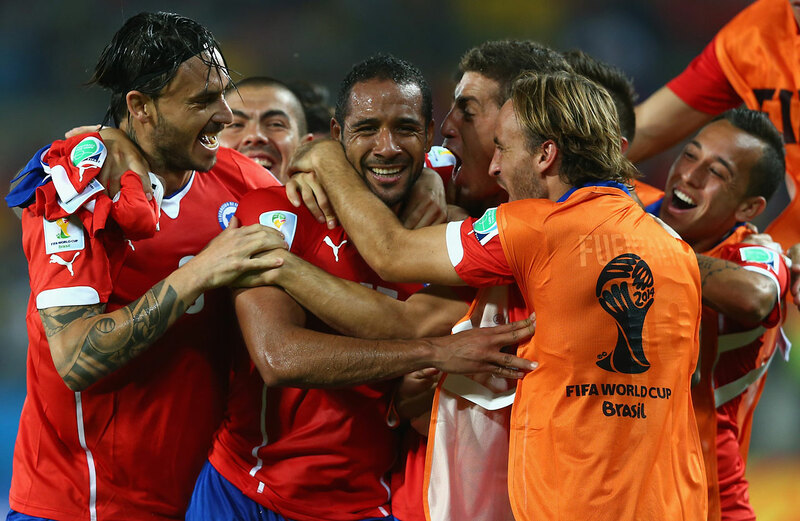 Chile went on to defeat Australia 3-1 in the group B game at the Arena Pantanal in Cuiaba, Brazil. Jean Beausejour of Chile is congratulated by teammates after scoring his team's third goal against Australia at Arena Pantanal on June 13. 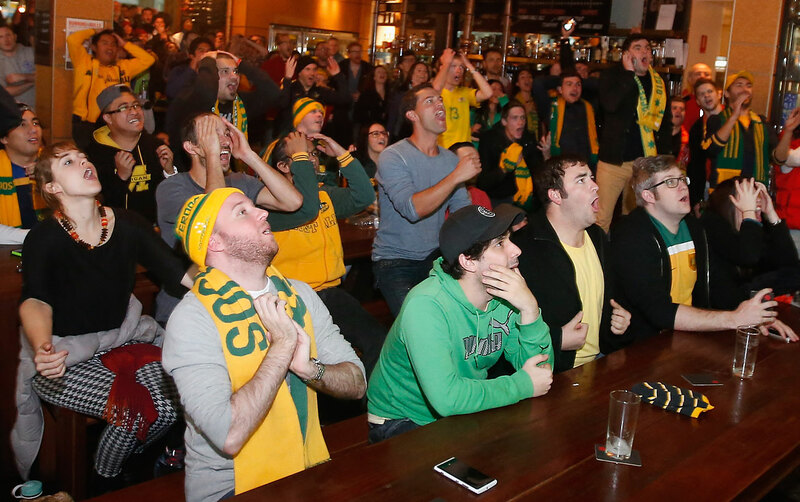 Nervous Australian fans watch the World Cup match against Chile at a bar on June 13 in Melbourne, Australia. Spain's Xabi Alonso scores a penalty kick during the group B match between Spain and the Netherlands. It was the only goal his side scored in a 5-1 loss to the Dutch. Spain soccer fans celebrate a goal against the Netherlands as they watch the World Cup game at the Yara cinema in Havana, Cuba, Friday, June 13. 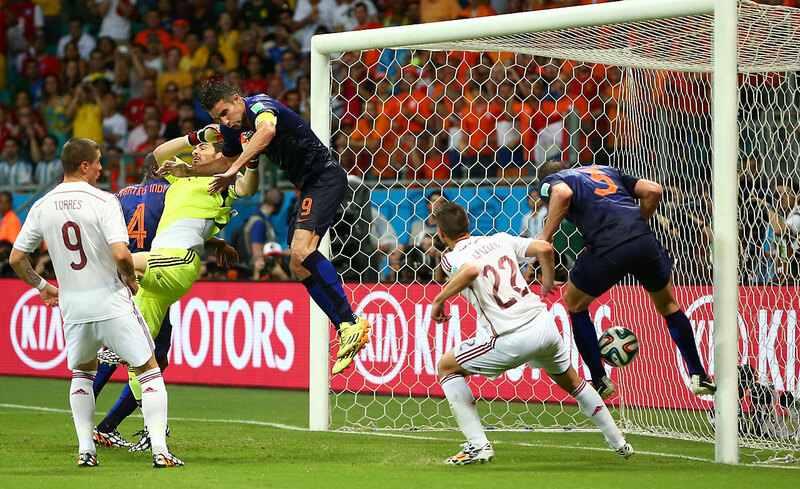 Netherlands' Robin van Persie heads the ball to score during a 5-1 win over Spain that matched the 2010 World Cup finalists against one another at the Arena Ponte Nova in Salvador, Brazil. 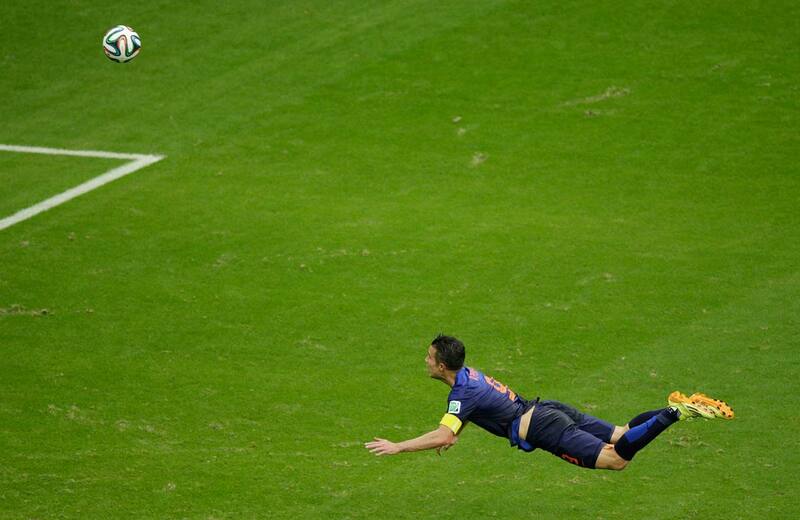 Another angle on the header by Robin van Persie. 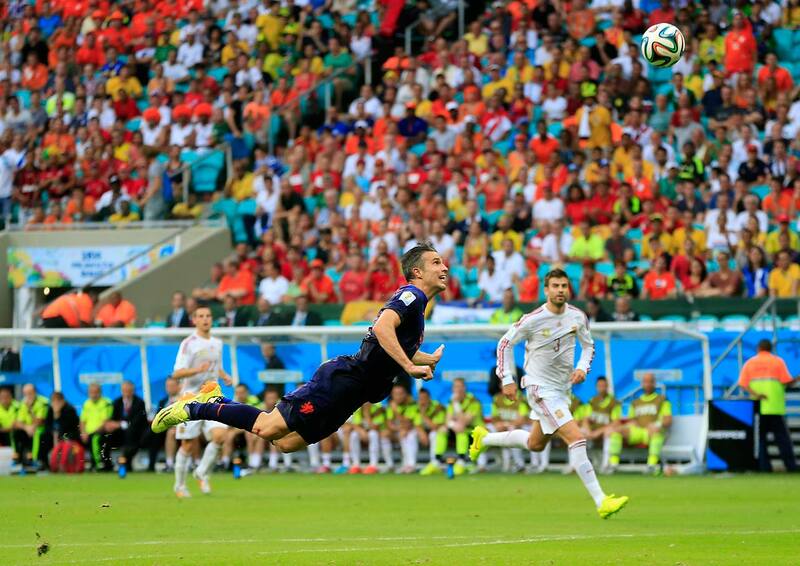 Stefan de Vrij of the Netherlands (right) scores a goal against Spain at Arena Fonte Nova on June 13. 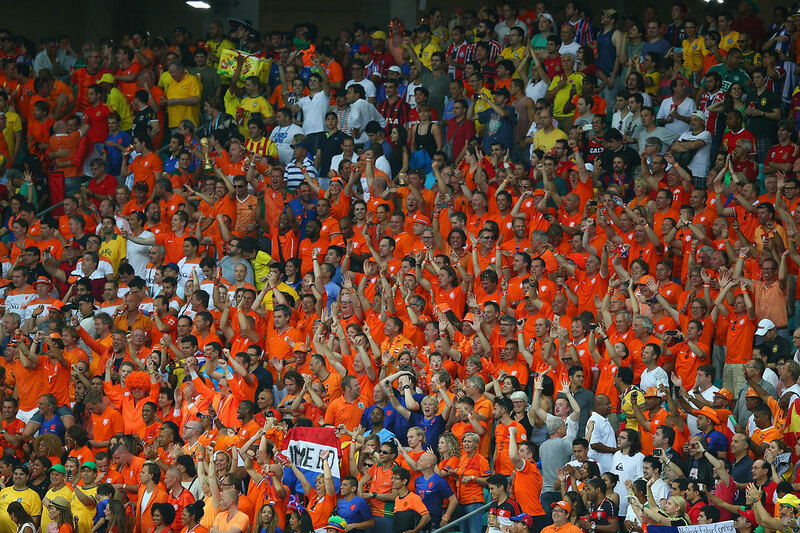 Fans of the Netherlands cheer during the Group B match between Spain and Netherlands at Arena Fonte Nova on June 13. 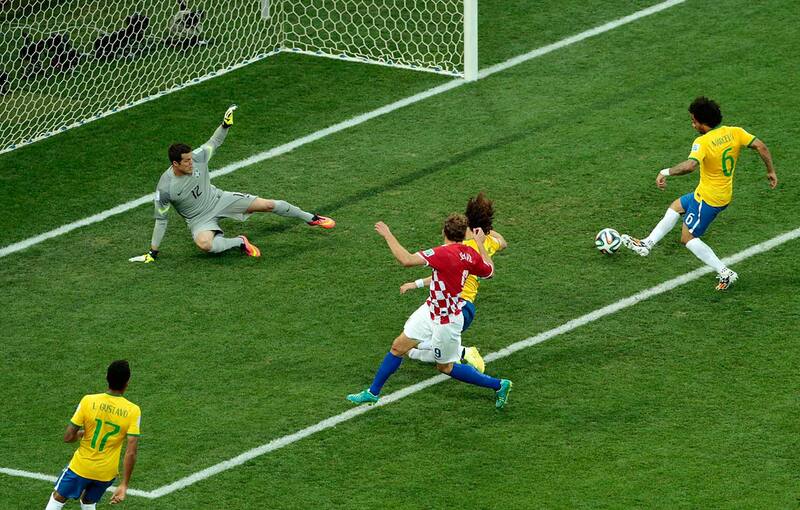 Brazil's Marcelo, right, scores an own goal to give Croatia a 1-0 lead. 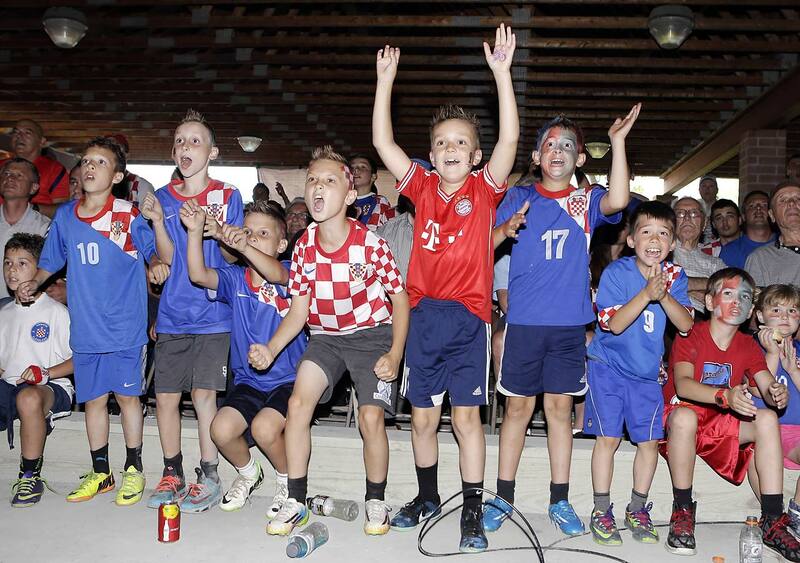 Children in Eastlake, Ohio, cheer for Croatia as they watch the match between Croatia and Brazil at the Croatia Cleveland Soccer Club Thursday, June 12. 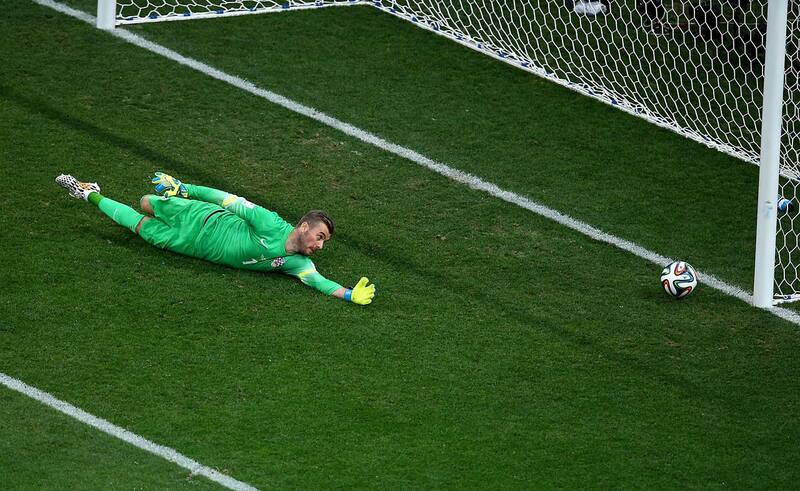 Stipe Pletikosa of Croatia dives and fails to make a save on a shot by Neymar. 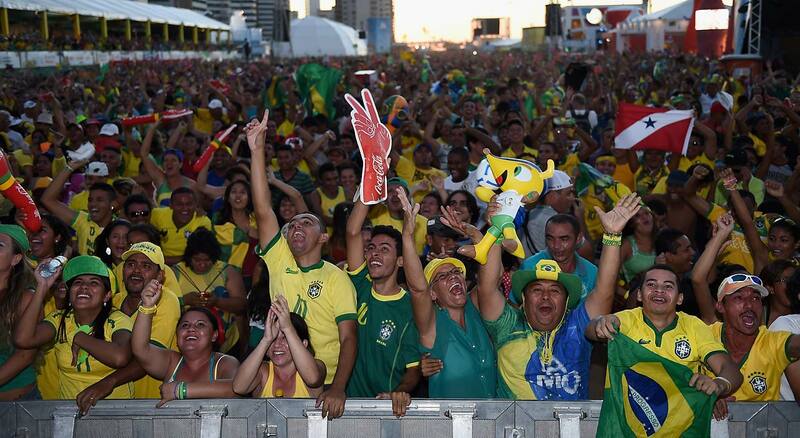 Brazil fans celebrate the first goal scored by Neymar. 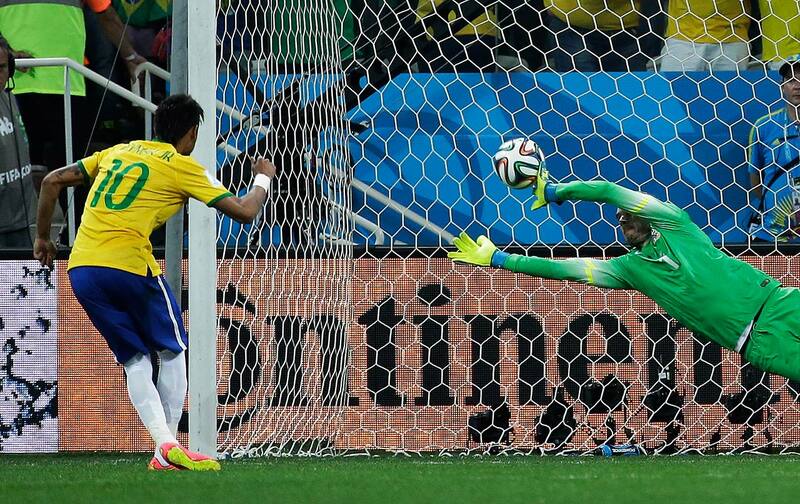 Neymar scores his second goal, this one from the penalty spot. 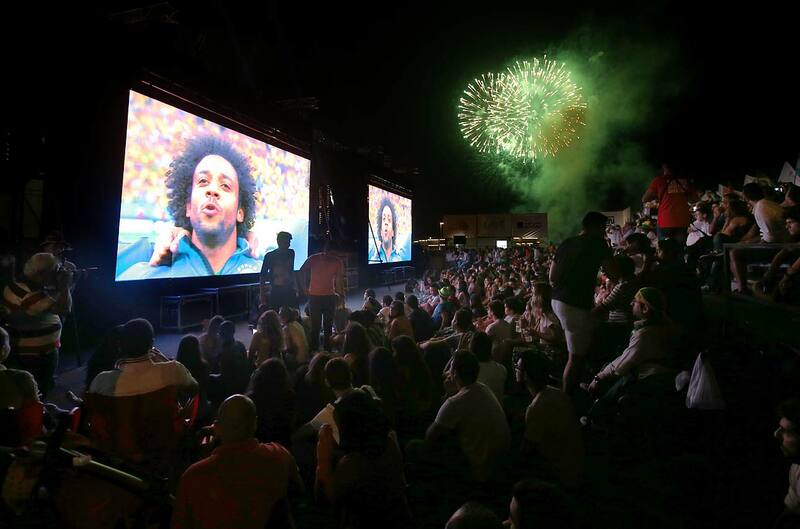 Fireworks are displayed over Lebanese soccer fans who have gathered to watch the first soccer match of the World Cup between Brazil and Croatia, at a fan park, in downtown Beirut, Lebanon, Thursday June 12, 2014. 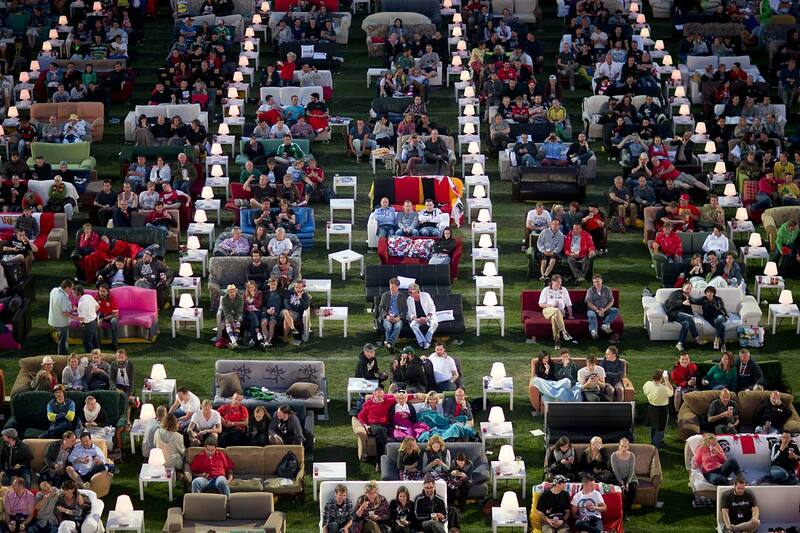 German soccer fans watch the opening game of the soccer World Cup 2014 while sitting on sofas in the 1.FC Union stadium in Berlin, Thursday, June 12, 2014. 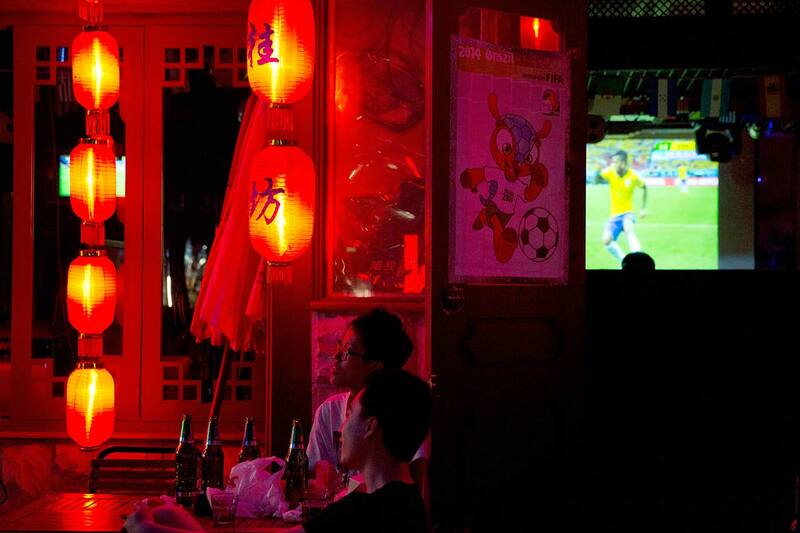 Chinese soccer fans watch the opening match of the 2014 World Cup between Brazil and Croatia, at a bar in Beijing, China. 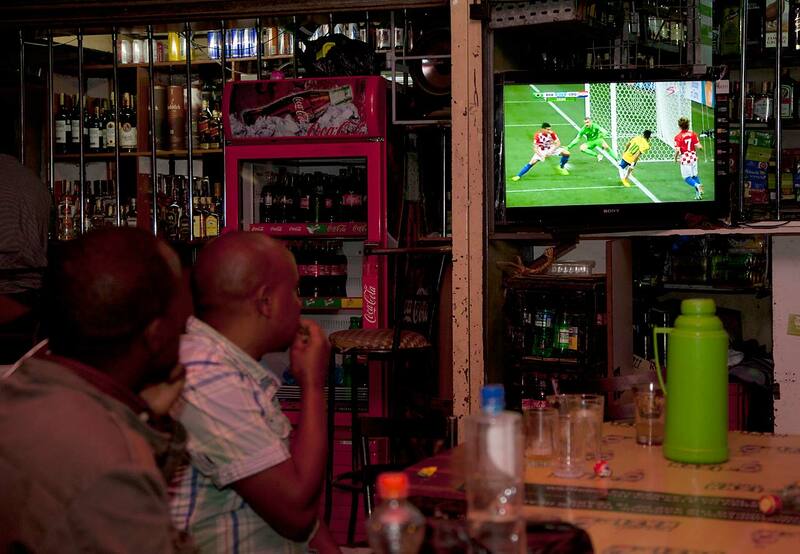 Kenyan soccer fans watch Brazil play Croatia in the World Cup opening match. 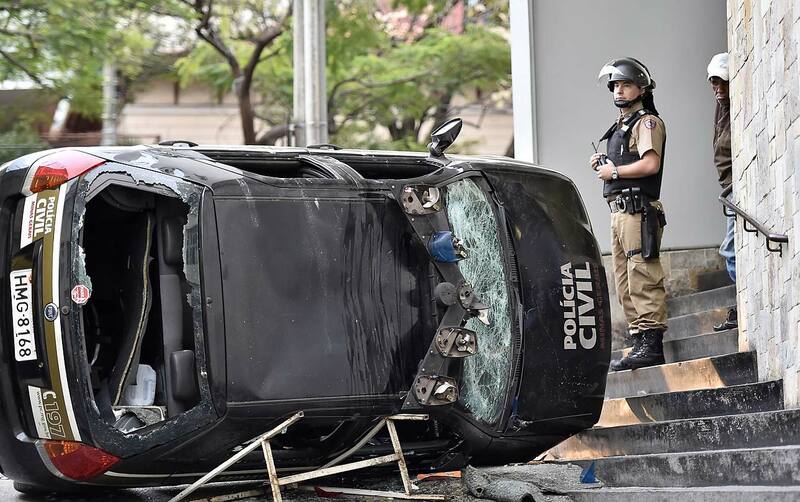 A police officer stands next to a destroyed police car during a violent demonstration at the 2014 World Cup in the center of Belo Horizonte , Brazil, on June 12, 2014. 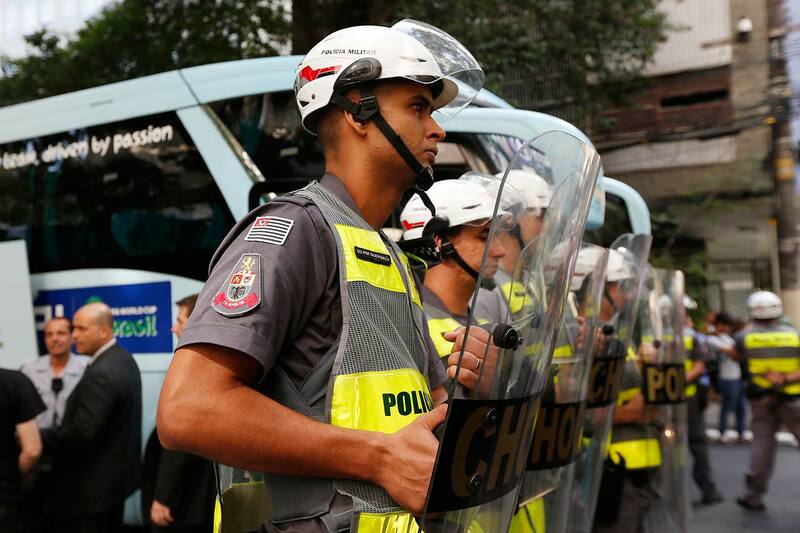 Protesters clashed with police at a rally against the World Cup, demanding better public services and protesting the money spent on the soccer tournament. Singer Jennifer Lopez performs during the Opening Ceremony of the 2014 FIFA World Cup Brazil at Arena de Sao Paulo on June 12. Jennifer Lopez and Claudia Leitte during the Opening Ceremony at Arena de Sao Paulo on June 12. Jennifer Lopez, rapper Pitbull and singer Claudia Leitte perform during the Opening Ceremony at Arena de Sao Paulo on June 12. 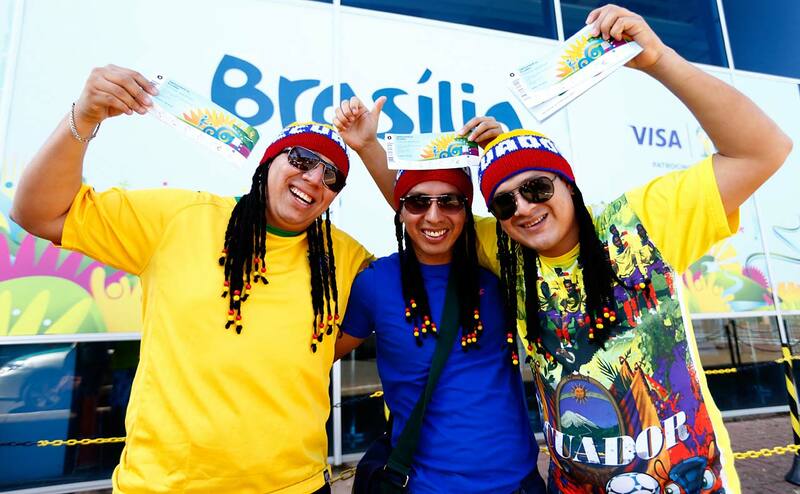 Ecuador fans hold their match tickets outside of the National Stadium, ahead of their opening game of the 2014 FIFA World Cup against Switzerland on June 12 in Brasilia, Brazil. 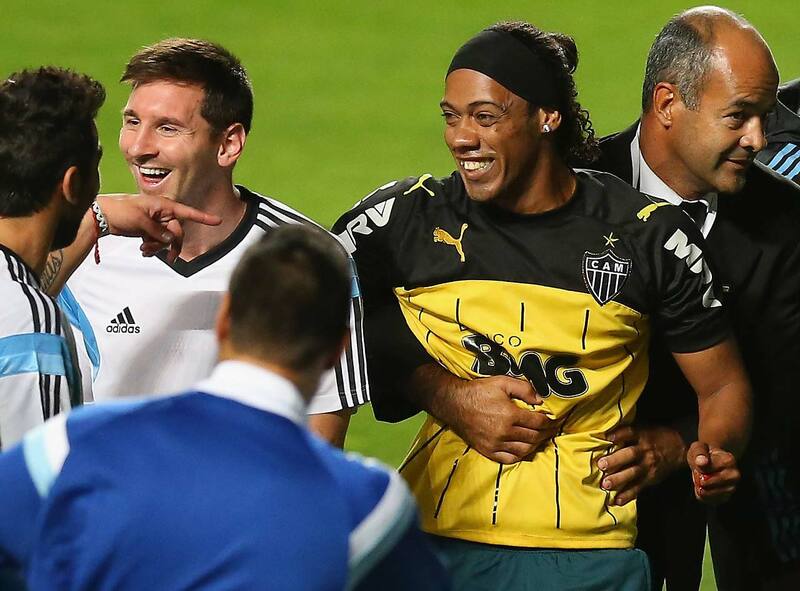 A fan bearing the resemblance of Ronaldinho is escorted off the field while talking to Lionel Messi of Argentina after an open training session on June 11 in Belo Horizonte, Brazil. 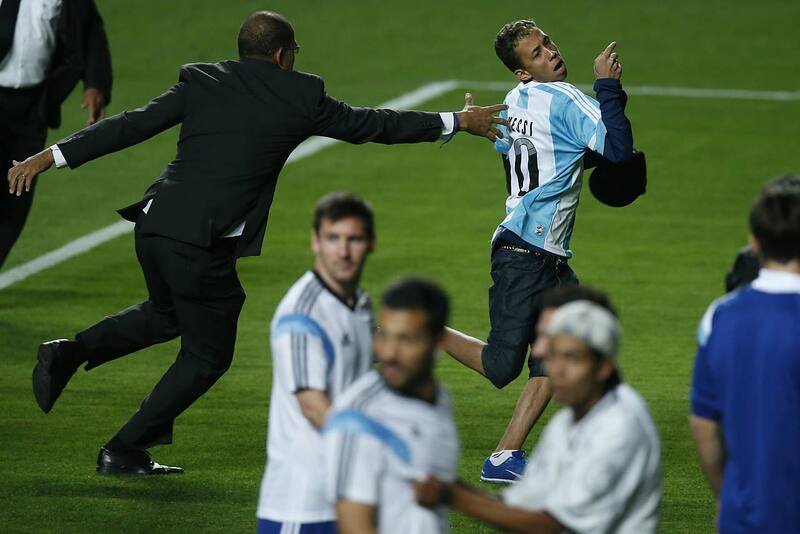 A security guard fails to stop a fan who invaded the pitch wearing an Argentine jersey, top, as Argentina's Lionel Messi, center, and other players look on at the end of a training session at Independencia Stadium in Belo Horizonte, Brazil, on June 11. 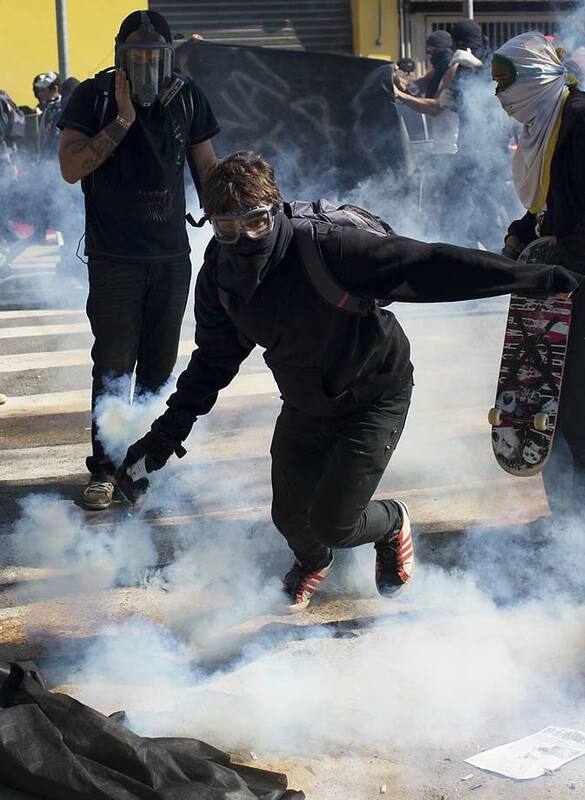 A masked man throws a stone towards riot policemen during a June 12 protest by people demanding better public services and against the money spent on the World Cup soccer tournament in Sao Paulo. Brazilian police clashed with anti-World Cup protesters trying to block part of the main highway leading to the stadium that hosts the opening match of the tournament. A masked protester returns a tear gas canister to riot police during a June 12 demonstration by people demanding better public services and against the money spent on the World Cup soccer tournament. Brazilian police clashed with anti-World Cup protesters trying to block part of the main highway leading to the stadium that hosts the opening match of the tournament. 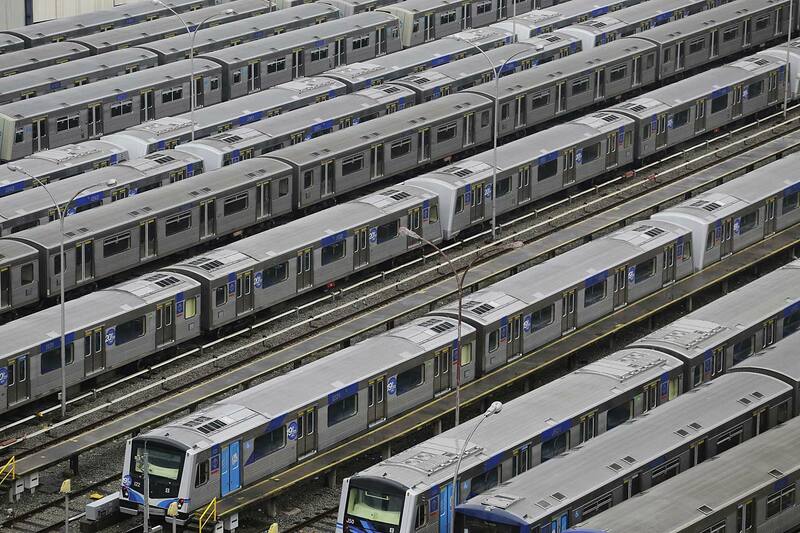 In this June 6, 2014, file photo, metro trains sit parked on the second day of a strike by the operators in Sao Paulo, Brazil. 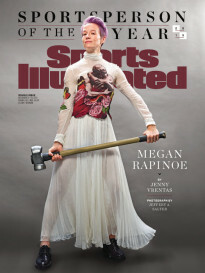 A possible subway strike in Sao Paulo during the tournament would cripple transportation in South America’s biggest city. Authorities are counting on most fans getting to Thursday’s match via the subway. 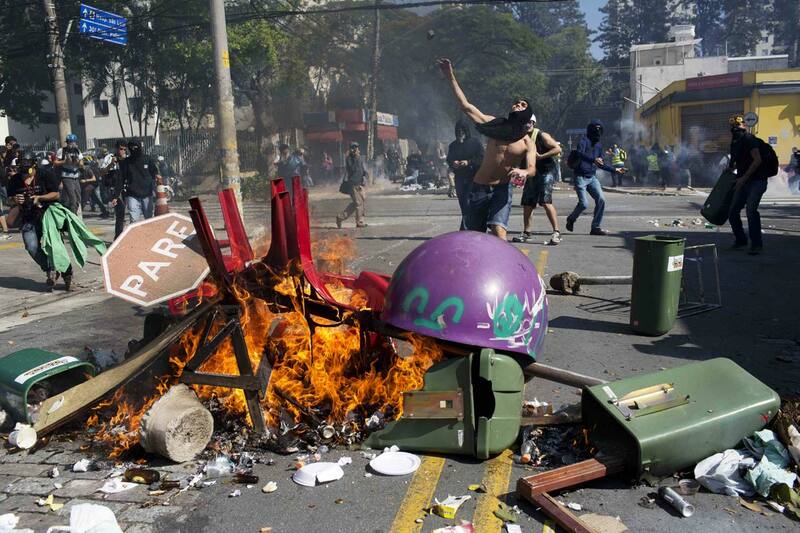 Meanwhile, anti-World Cup protests were called for in at least six major cities, including Sao Paulo. 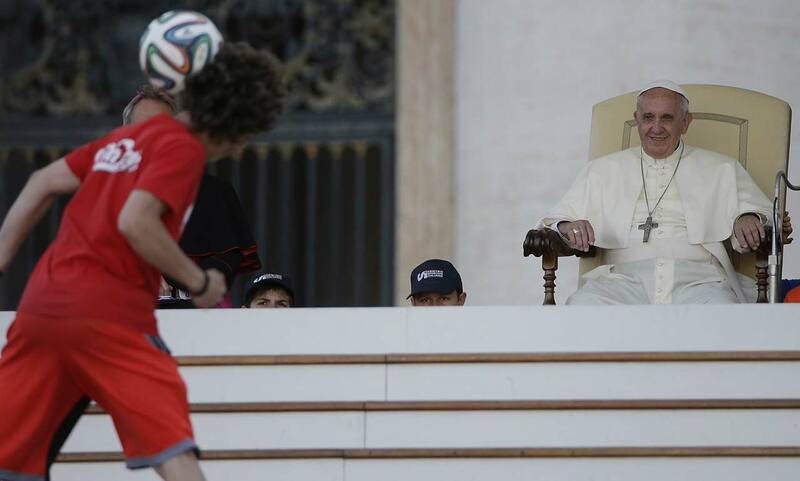 In this photo taken June 7, a soccer player performs in front of Pope Francis during an audience granted to the members of the Italian Sport Centers in St. Peter's Square, at the Vatican. Pope Francis has a message for the World Cup: Let football be a showcase for teamwork and solidarity, not an exhibition of racism and greed. The Argentine-born, football-loving pope recorded a video message that will be broadcast on Brazilian television ahead of the Thursday, June 12, opening match between Brazil and Croatia. South Korea's national soccer team coach Hong Myung-bo, second from right, gives instructions to his players during a training session in Foz do Iguacu, Brazil, on June 11. 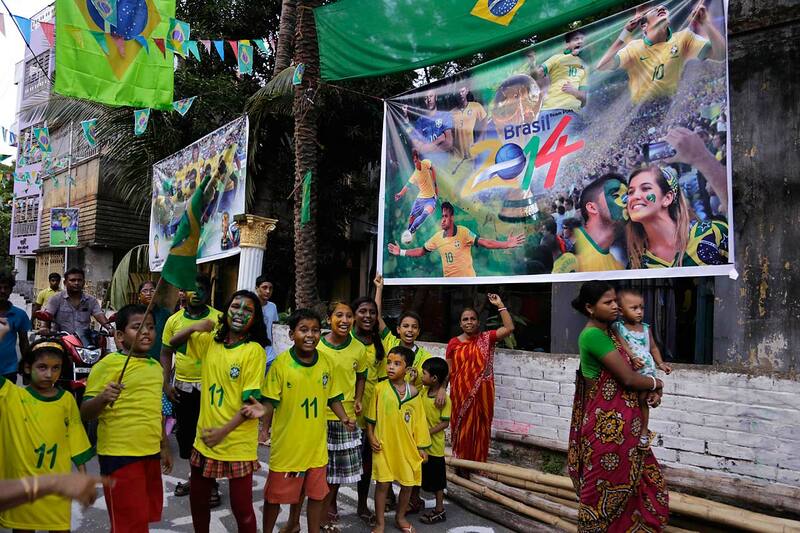 Indian supporters of Brazil in Kolkata, India, cheer for their team ahead of the inaugural match of the World Cup. 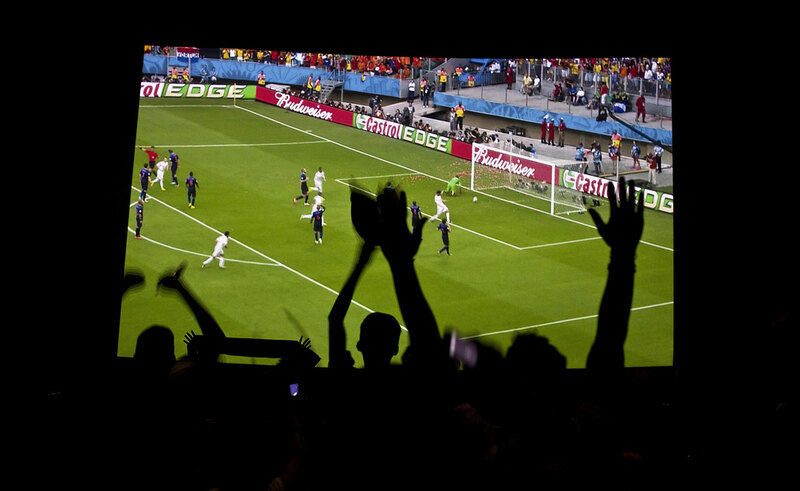 Nearly half the world's population, well over 3 billion spectators, is expected to watch soccer's premier event. 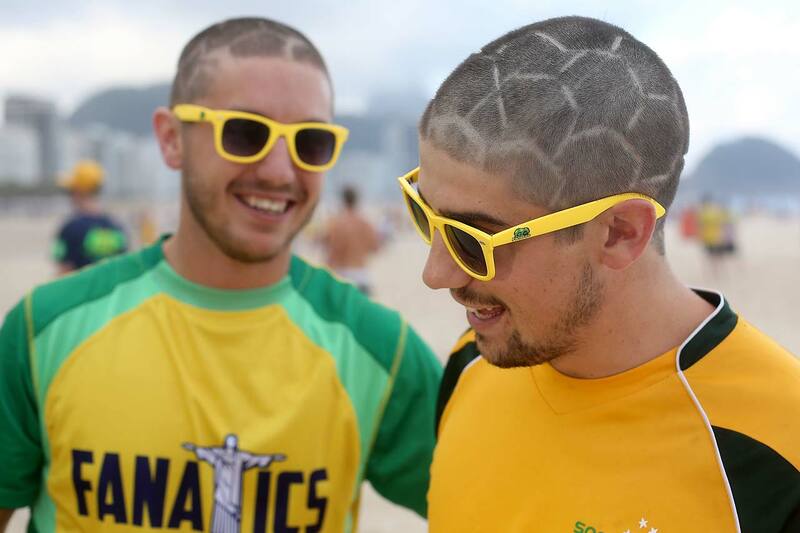 Two Australian football fans show off their football style haircuts at Copacabana beach on June 11. 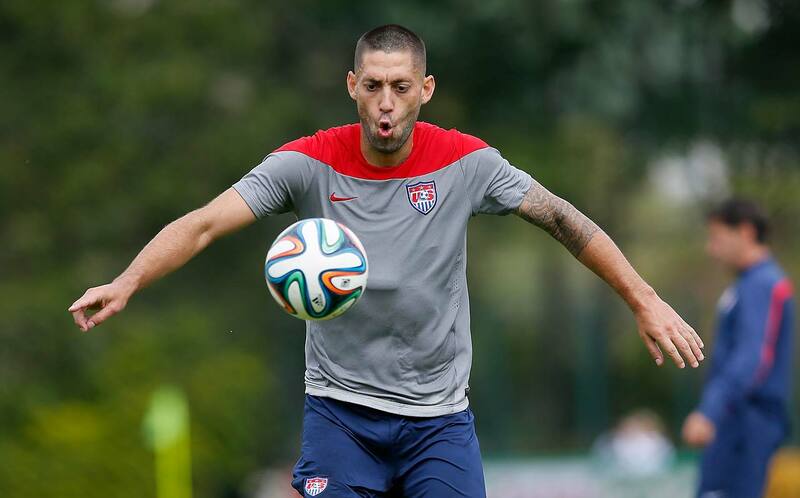 Clint Dempsey of the United States runs drills during a June 11 training session at Sao Paulo FC. 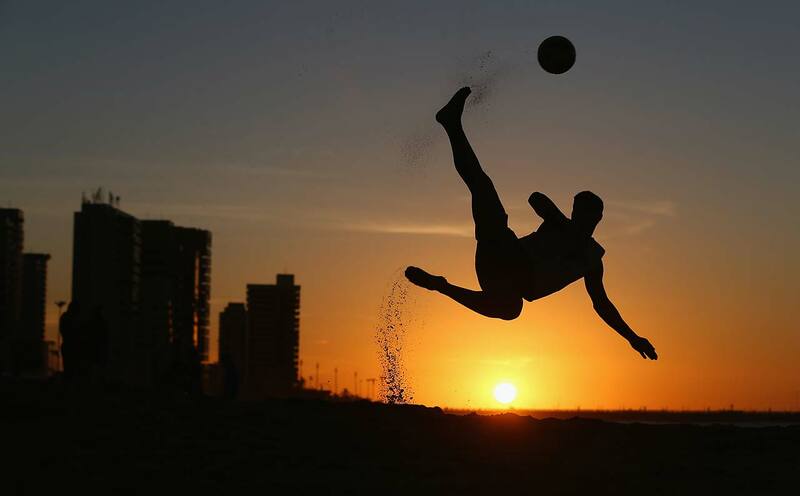 A local boy shows off his beach football skills on Magna Praia beach on June 11 in Fortaleza, Brazil. 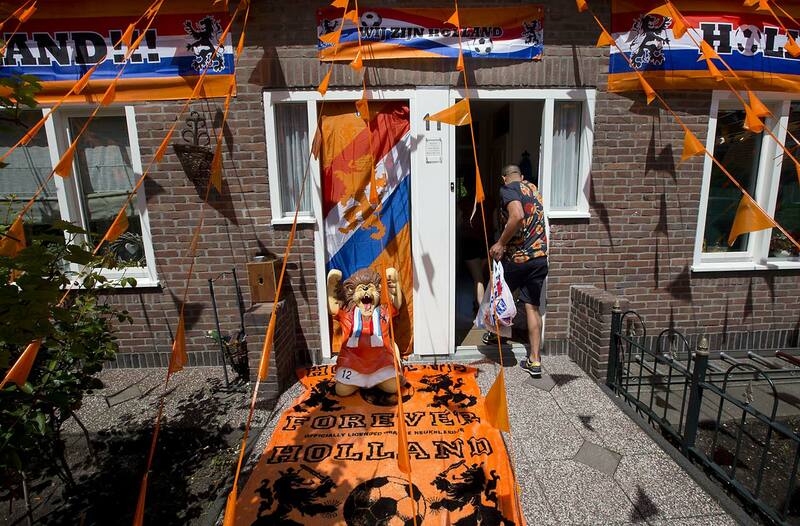 A man enters his house decorated in the colors of the Dutch soccer team in Amsterdam, Netherlands, on June 12. 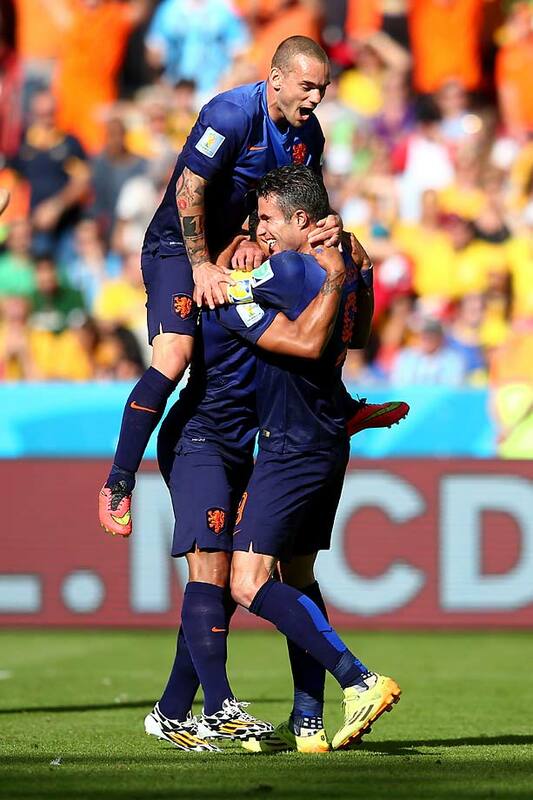 The Netherlands plays its first World Cup Group B match against Spain on Friday June 13. 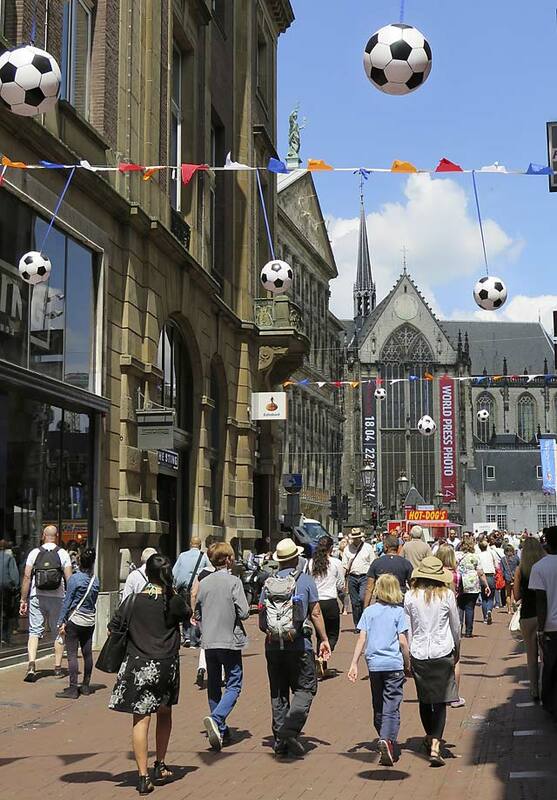 People walk under World Cup soccer decorations in the Kalverstraat in the center of Amsterdam, June 12. The Netherlands plays its first World Cup Group B match against Spain on Friday June 13. 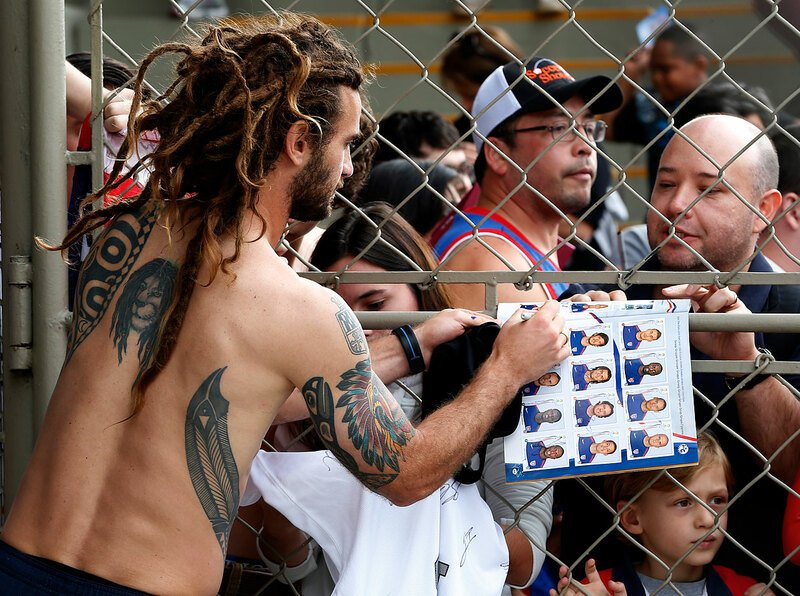 United States' Kyle Beckerman signs autographs following a training session at the Sao Paulo FC training center in Sao Paulo on June 11. Portugal’s soccer player Cristiano Ronaldo walks down from a plane as they arrive at the Viracopos airport, in Campinas, Brazil, on June 11. 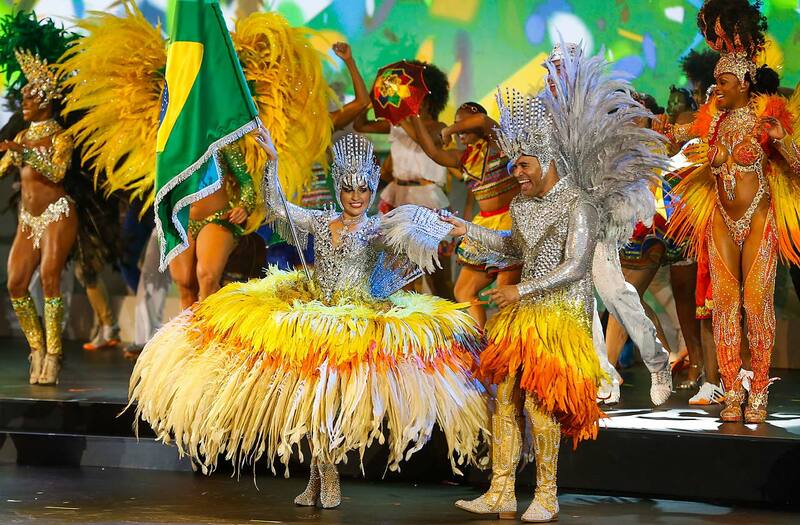 Artists perform during the opening ceremony of the 64th FIFA Congress at the Expocenter Transamerica on June 10 in Sao Paulo. 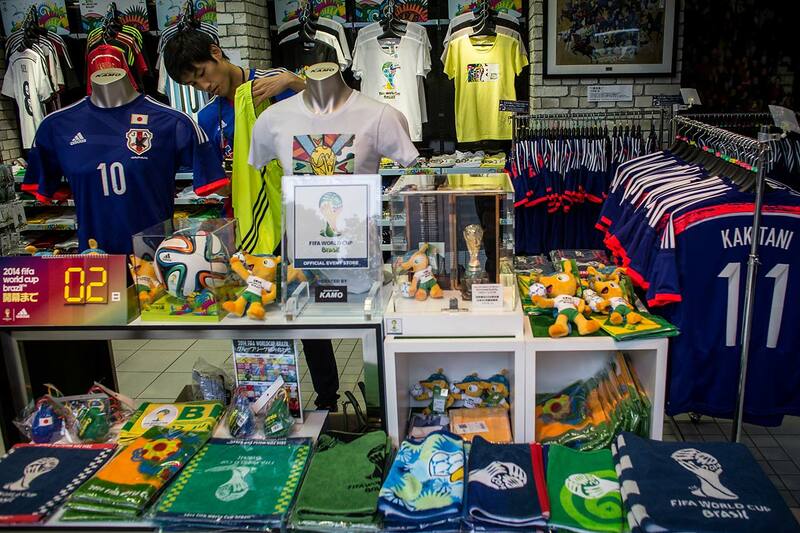 A shop attendant works amongst Japan World Cup team merchandise and FIFA World Cup 2014 merchandise at a football store on June 11 in Tokyo. 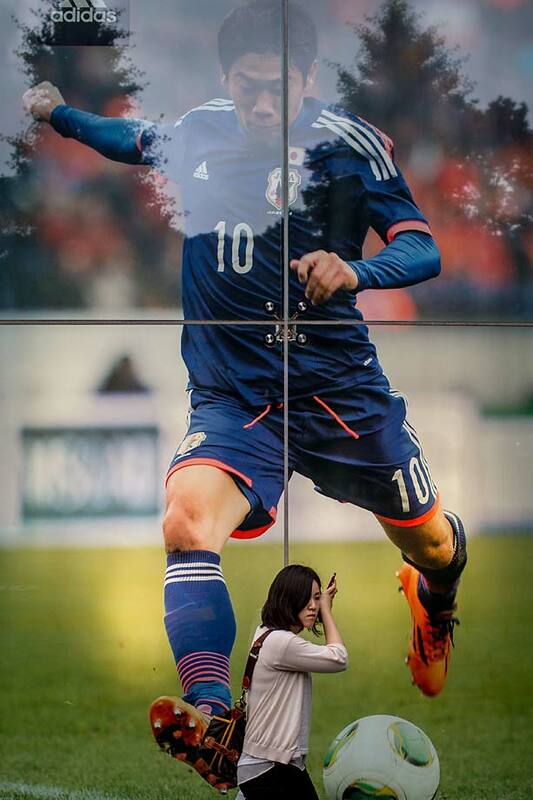 A woman walks past a shop window displaying a poster of Japanese football player Shinji Kagawa on June 11, 2014 in Tokyo. Italy's Andrea Pirlo practices shooting free kicks during a training session for the World Cup in Mangaratiba, Brazil, on June 11. Colombia soccers fans chant slogans with their nation's flag outside Arena Corinthians stadium in Sao Paulo, Brazil on June 11. 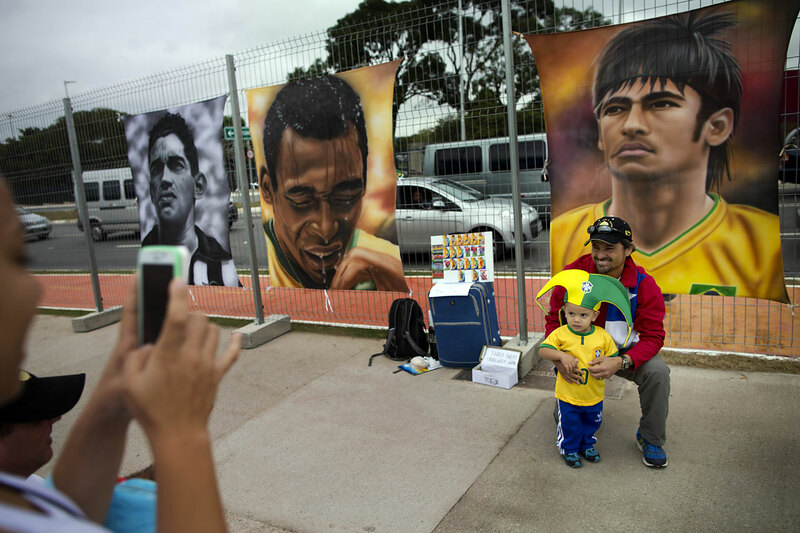 A man poses for the picture with his son next to portraits of Brazilian soccer idols Neymar, right, Pele, center, and Garrincha, left, outside Arena Corinthians stadium in Sao Paulo on June 11. 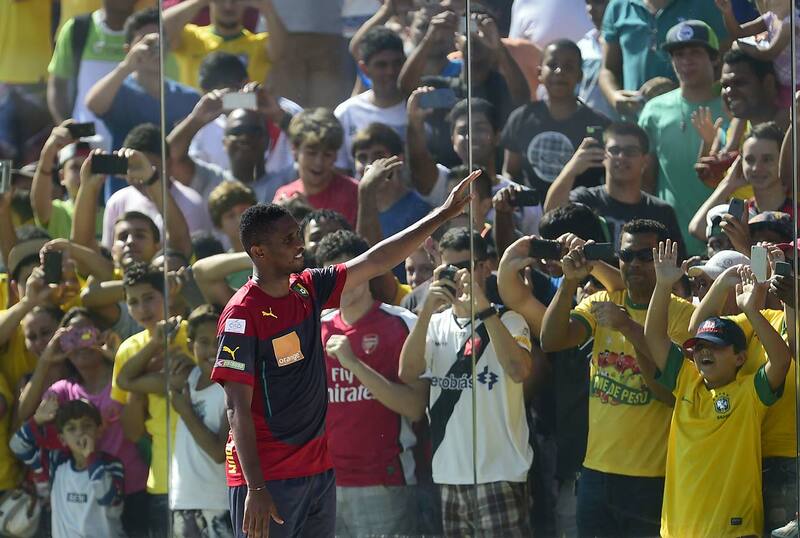 Cameroon's forward Samuel Eto'o (front C) waves to fans during a training session with his team at the Kleber Andrade stadium in Vitoria on June 10, 2014, ahead of the 2014 FIFA World Cup football tournament. 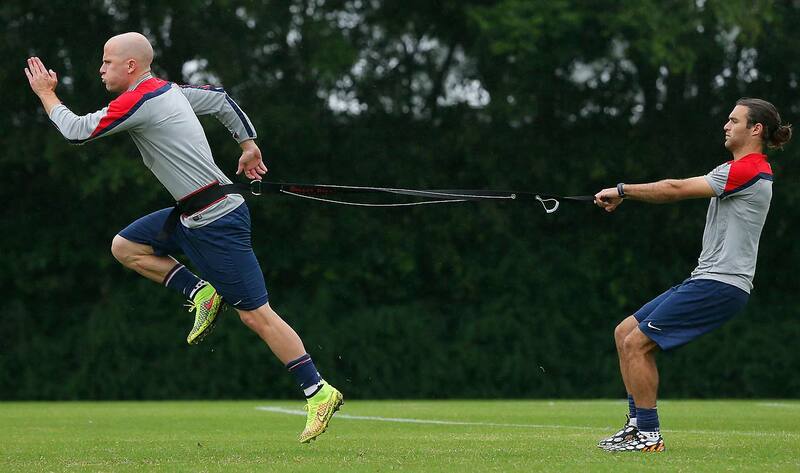 Michael Bradley and Graham Zusi of the United States work out during their training session at Sao Paulo FC on June 10. 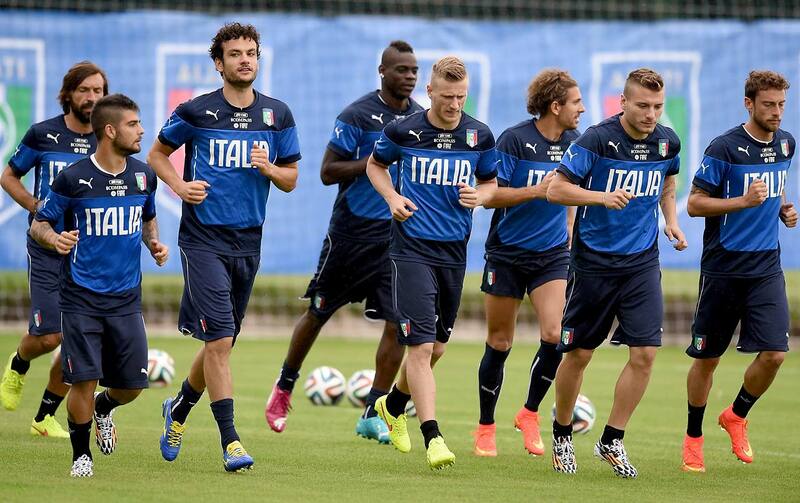 Players of Italy during a training session on June 10 in Rio de Janeiro. 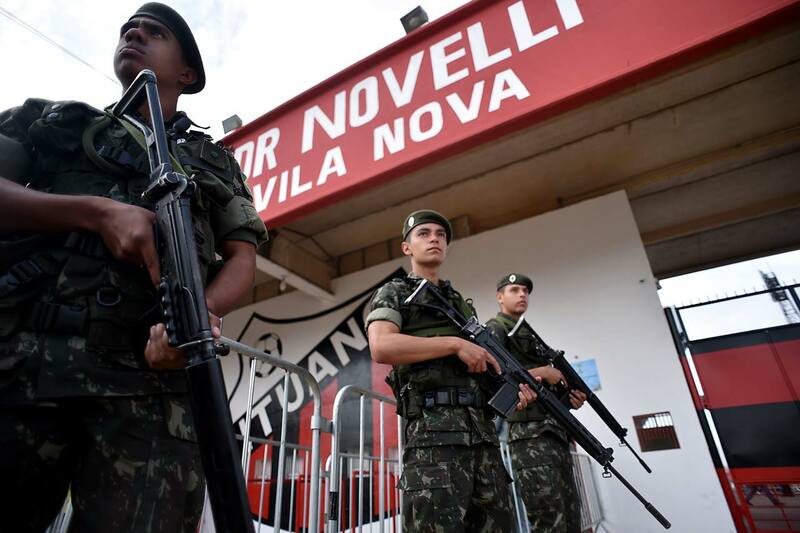 Brazilian military troops stand guard before the training session of Russia's national football team at Estadio Novelli Jr in Itu, close to Sao Paolo, on June 10. 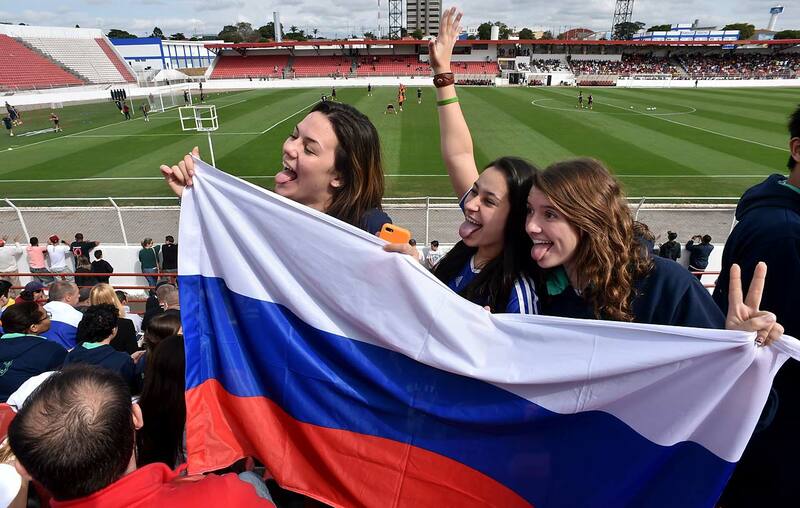 Supporters pose with a national flag as members of Russia's national football team take part in a training session at Estadio Novelli Junior in Itu on the outskirts of Sao Paulo on June 10. Spanish national team players attend a training session at the Atletico Paranaense training center in Curitiba, Brazil, on June 10. 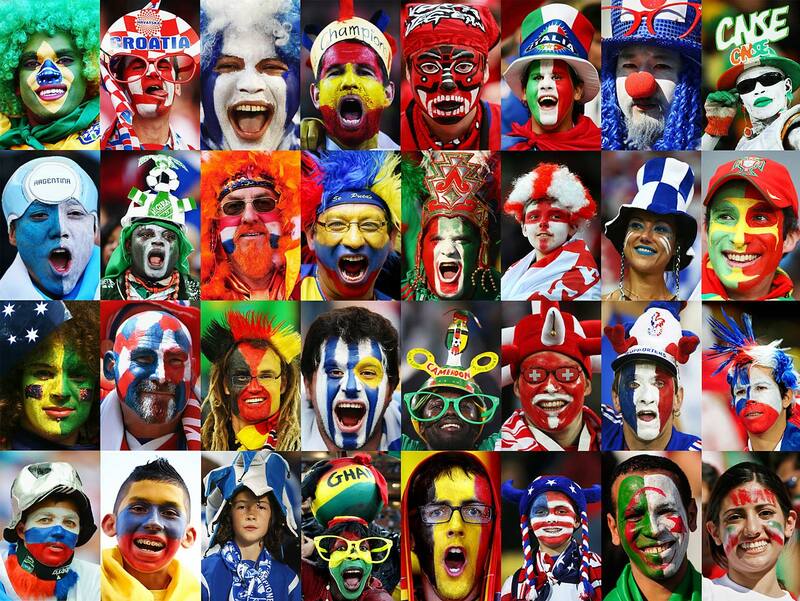 This composite image shows a fan of each of the 32 national teams taking part in the 2014 World Cup. A view of the National Stadium complex in Brasilia, Brazil. 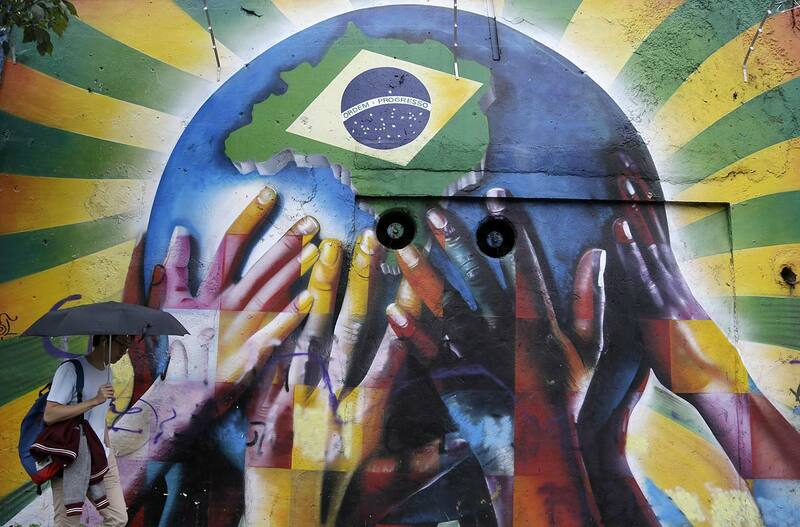 A pedestrian passes a graffiti depicting human hands holding the earth with the Brazilian flag in Sao Paulo on June 10. 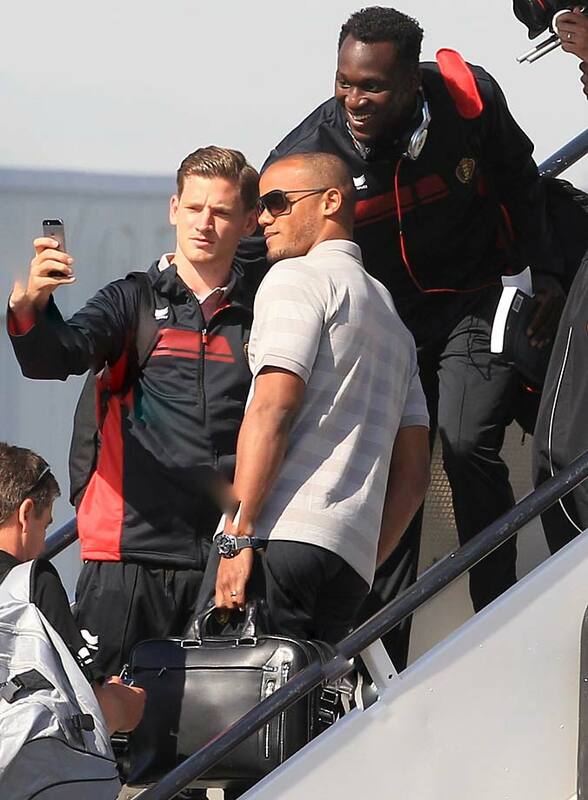 Belgian soccer players Vincent Kompany, center, Romelu Lukaku, top right, and Jan Vertonghen pose for a selfie prior to embarking the plane, departing from Brussels airport to Sao Paulo Brazil on June 10. 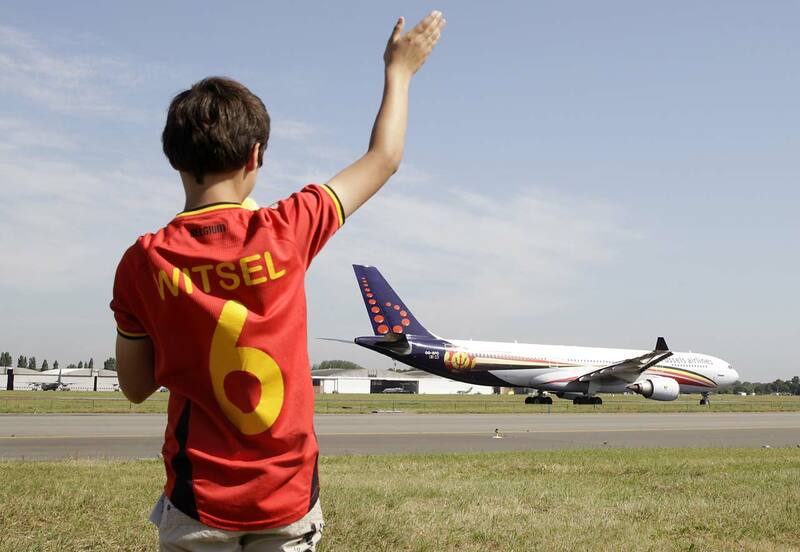 Belgium will play against South Korea, Russia and Algeria in Group H.
A young soccer fan waves to the plane carrying the Belgian soccer team, departing from Brussels airport to Sao Paulo on June 10. 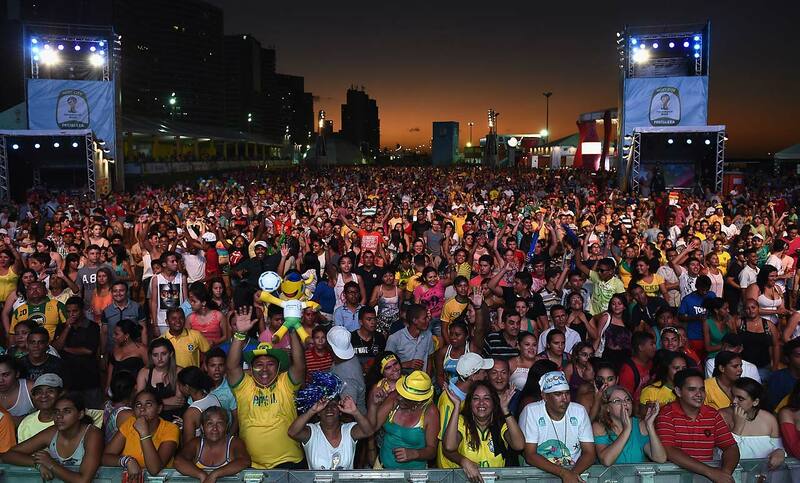 Brazilian fans enyoy the music as the sun sets during the 2014 FIFA World Cup Fan Fest Kick off Event on June 8, 2014 in Fortaleza, Brazil. Former Brazilian footballer Ronaldo shows off the World Cup during the 2014 FIFA World Cup Fan Fest Kick off Event on June 8, 2014 in Fortaleza, Brazil. 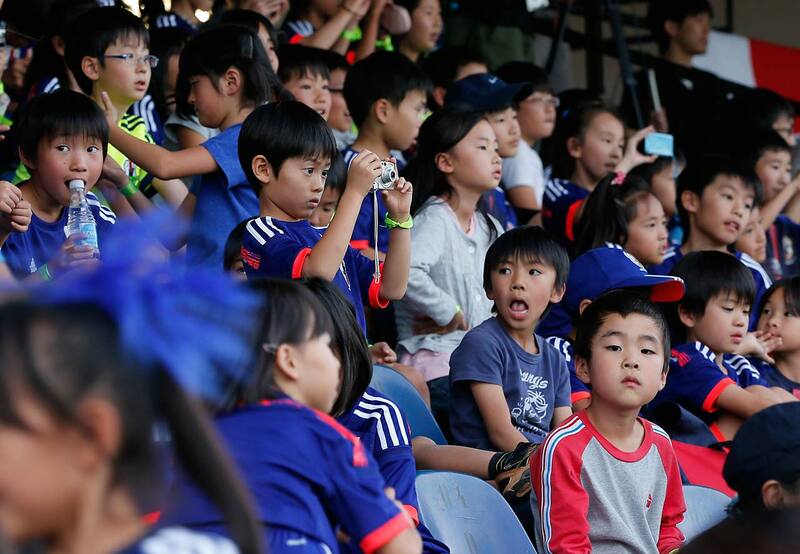 Students of a Japanese school in Sao Paulo watch a training session of Japan in Sorocaba, Brazil, Sunday, June 8. Japan plays in Group C of the 2014 World Cup. 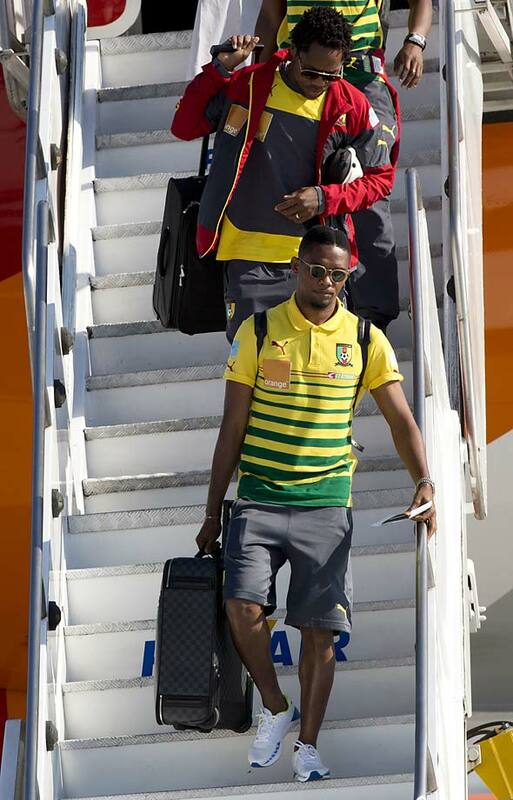 Samuel Etoío leaves the aircraft as Cameroon's national team arrives at the Galeao Air Base in Rio de Janeiro on Monday, June 9. Cameroon's World Cup team refused to board a plane due to take them to Brazil on Sunday because of a long-running dispute over bonus payments for the tournament, forcing their national federation to take out a loan to meet their demands. 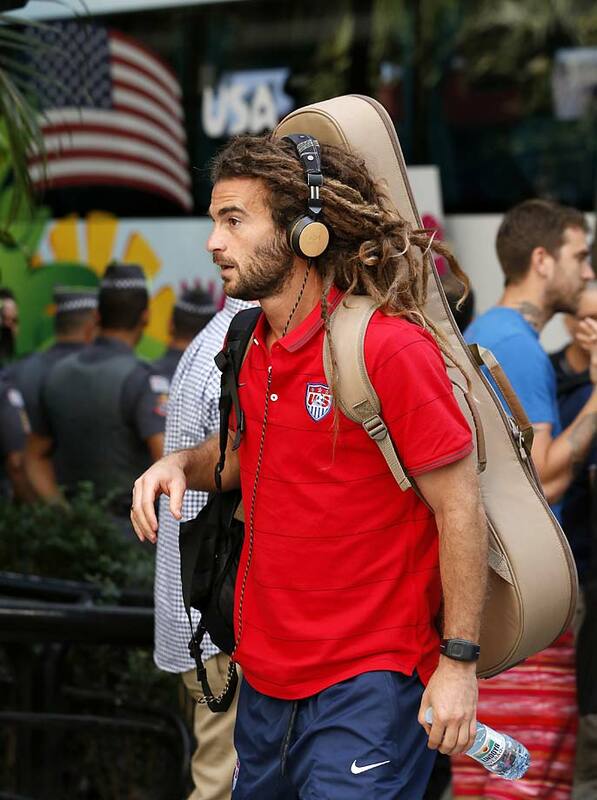 Kyle Beckerman of the U.S. arrives at the team hotel in Sao Paulo, Brazil, Monday, June 9, 2014. The U.S. will play in Group G.
United States' national soccer team player DeAndre Yedlin arrives at the Sao Paulo International airport in Brazil, Monday, June 9, 2014. Police officers stand guard near the United States bus upon arrival at the team hotel in Sao Paulo on Monday, June 9. 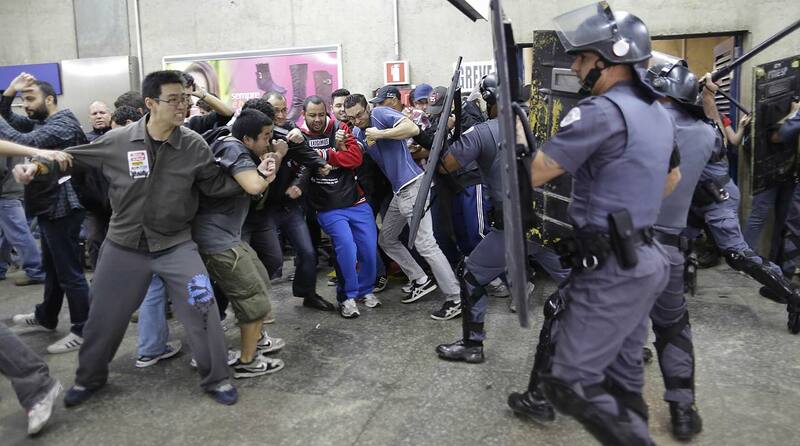 In this Friday, June 6, 2014 photo, subway train operators, along with some activists, clash with police at the Ana Rosa metro station on the second day of their metro strike in Sao Paulo. The workers clashed with police as they tried to block other operators from breaking the strike. Overland commuter train operators went on strike Thursday, putting at risk the only means that most soccer fans will have to reach Itaquerao stadium ahead of this week's World Cup. 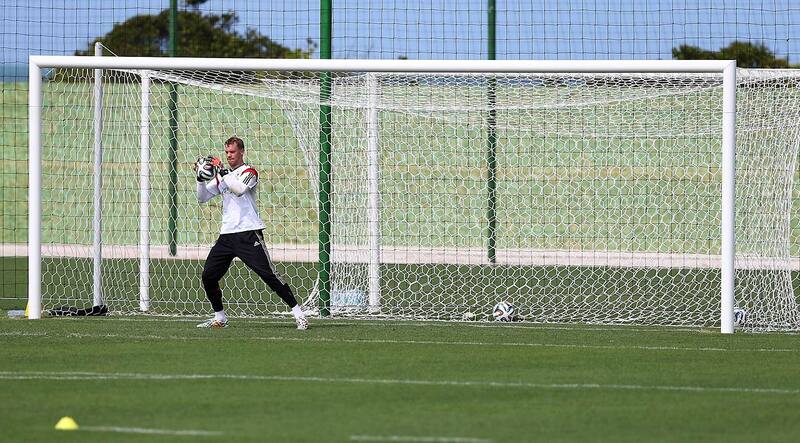 Goalkeeper Manuel Neuer makes a save during the German National team training session at Campo Bahia on June 9, 2014 in Santo Andre, Brazil. 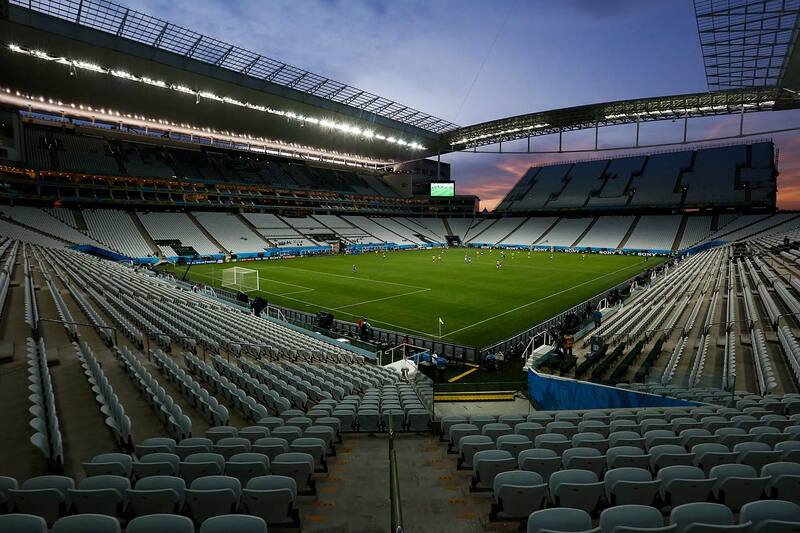 A general view of the Arena Corinthians Stadium during the match between Corinthians U20 v Corinthians U17 as part of the last technical test event on June 08, 2014 in Sao Paulo, Brazil. 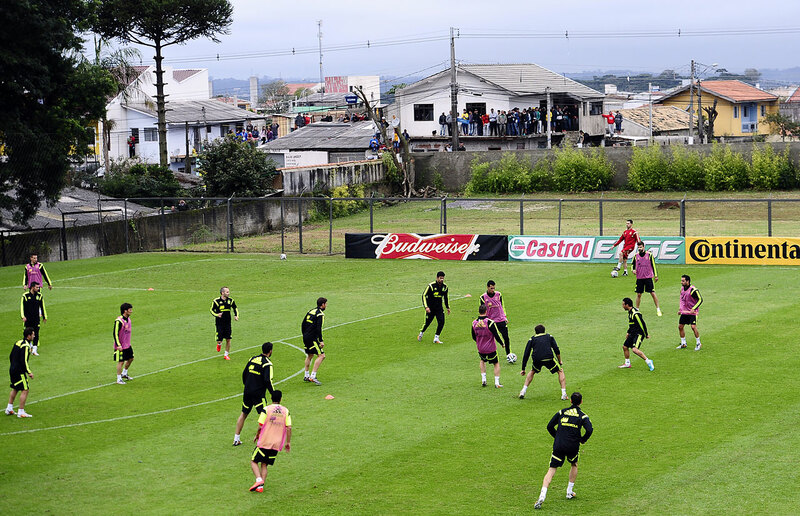 Spain players warm up during a training session at the Centro de Entrenamiento do Caju on June 9 in Curitiba, Brazil. 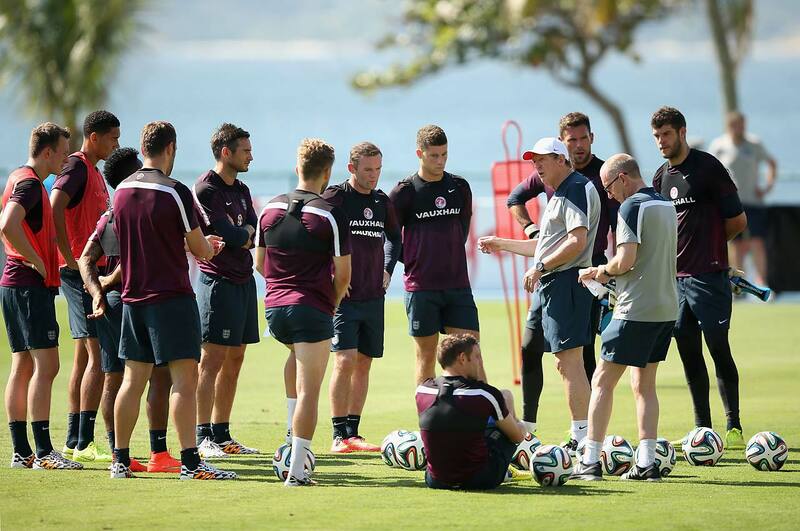 Roy Hodgson, manager of England, gives instructions to players during a training session at the Urca military base training ground on June 9, in Rio de Janeiro. 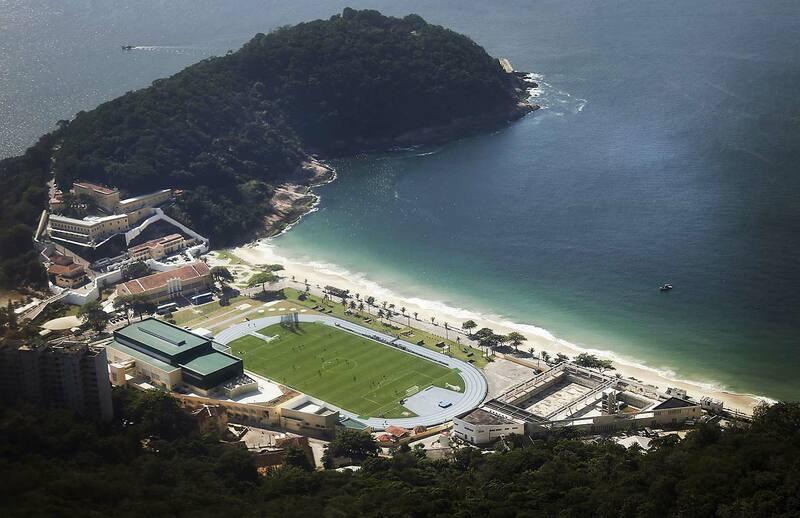 An aerial view of England's national soccer team training session in progress at the Urca military base near Copacabana beach on Monday, June 9. 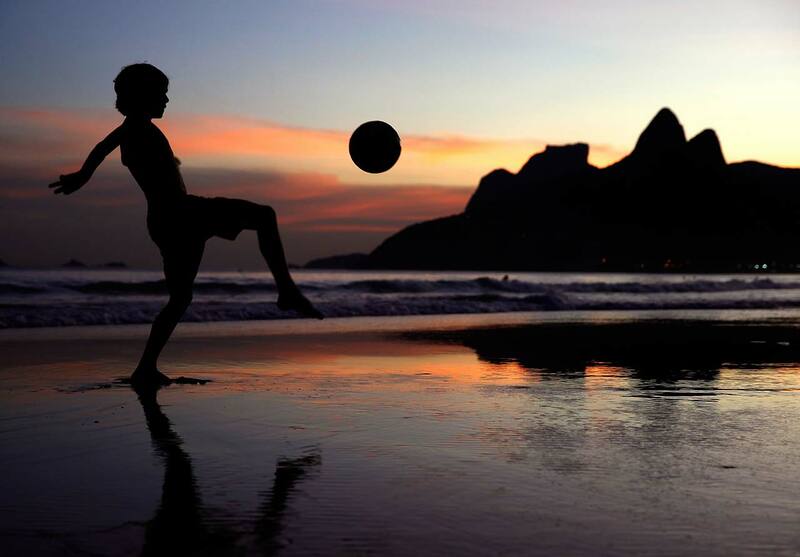 A young boy juggles a football on Ipanema Beach on Sunday, June 8, as the 2014 FIFA World Cup nears. 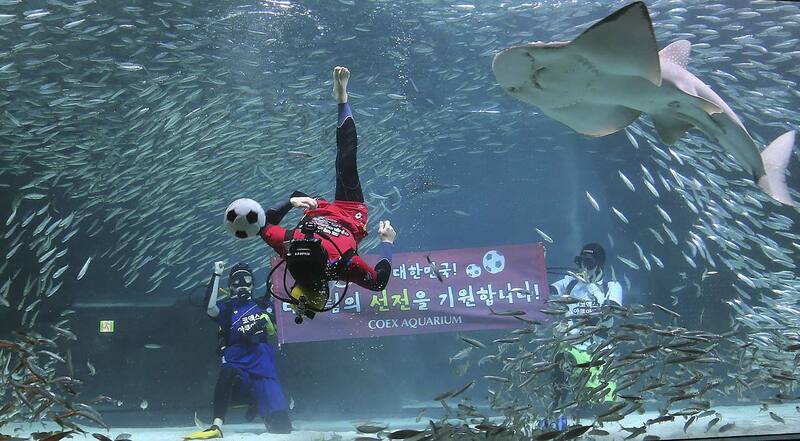 A diver wearing a South Korean soccer fan uniform performs with sardines during an event to promote the 2014 Brazil World Cup, at the COEX Aquarium in Seoul, South Korea, Monday, June 9, 2014. South Korea will face Russia, Belgium and Algeria in the 2014 Brazil World Cup. The writing on the banner reads " We hope for the success of the national soccer team." 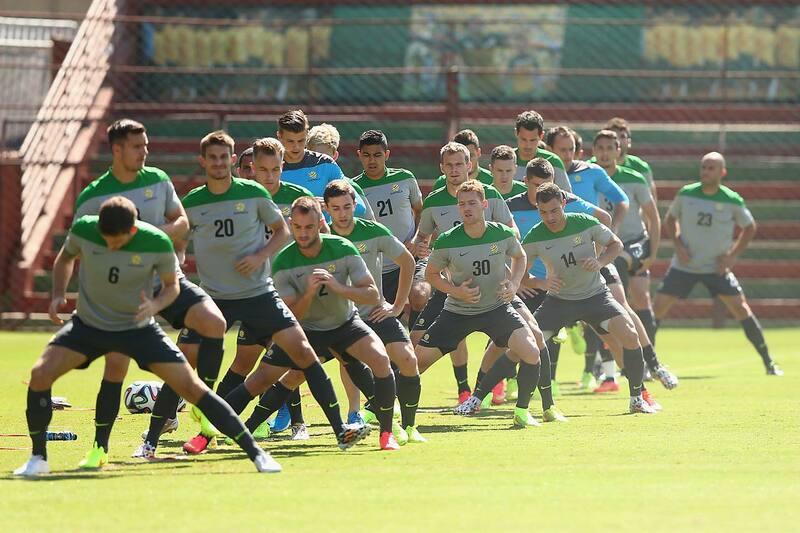 Socceroo players stretch during an Australian Socceroos training session at Arena Unimed Sicoob on June 9 in Vitoria, Brazil. 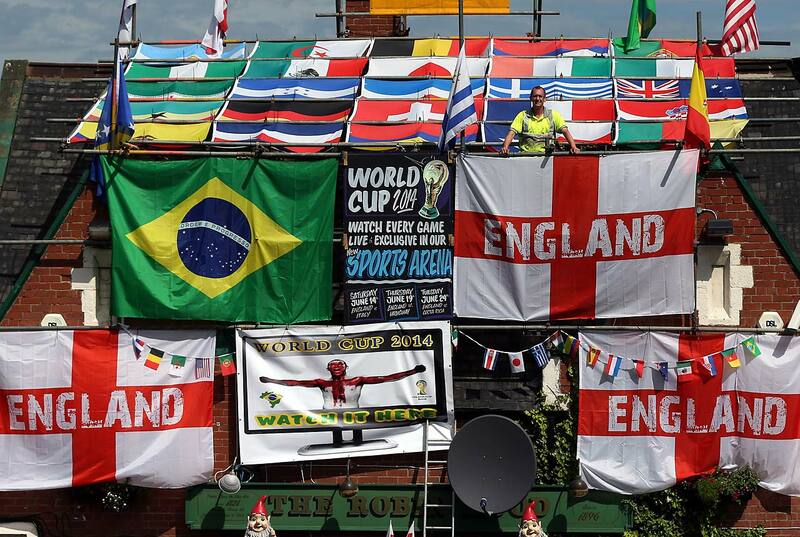 Employee Sean Mason hangs decorations and flags outside The Robin Hood public house in Jarrow, England, Monday, June 9, 2014 to create a display for World Cup 2014, which starts Thursday. 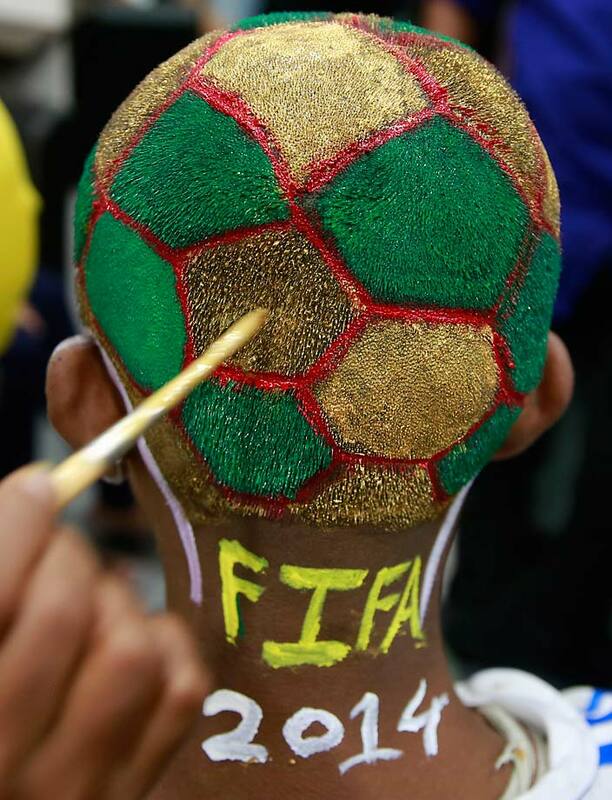 An Indian boy gets his head painted as part of a promotional event ahead of the soccer World Cup at a saloon in Mumbai, India, Monday, June 9, 2014. 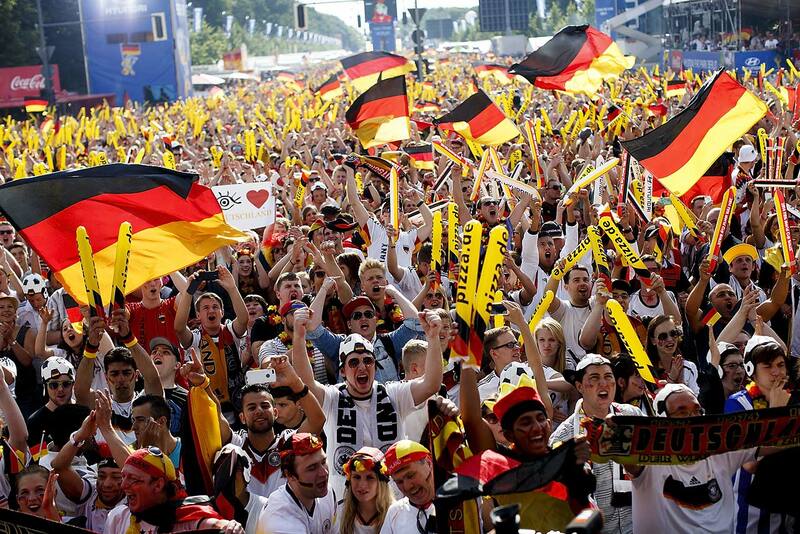 Soccer fans around the world are gearing up to watch the upcoming World Cup soccer tournament in Brazil. 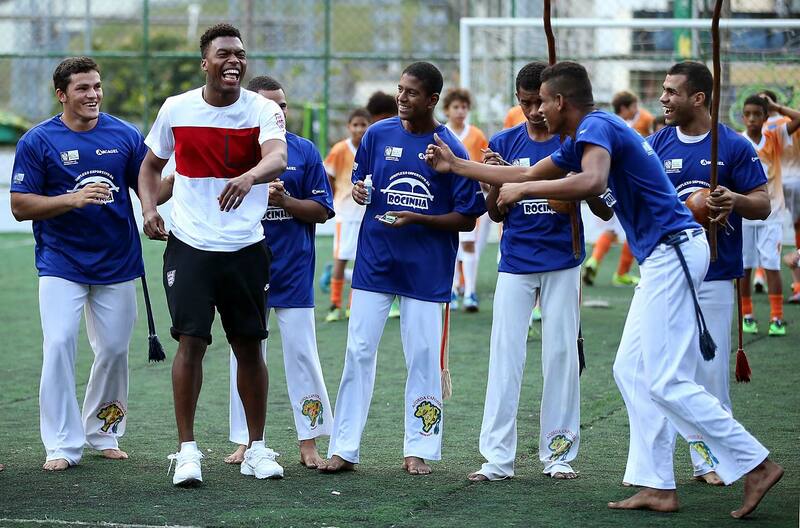 Daniel Sturridge laughs as he is invited to dance during a visit to Complexo Esportivo da Rocinha on June 9 in Rio de Janeiro. In this June 6, 2014, photo, a referee uses vanishing spray during a referee's training session in Rio de Janeiro, Brazil. 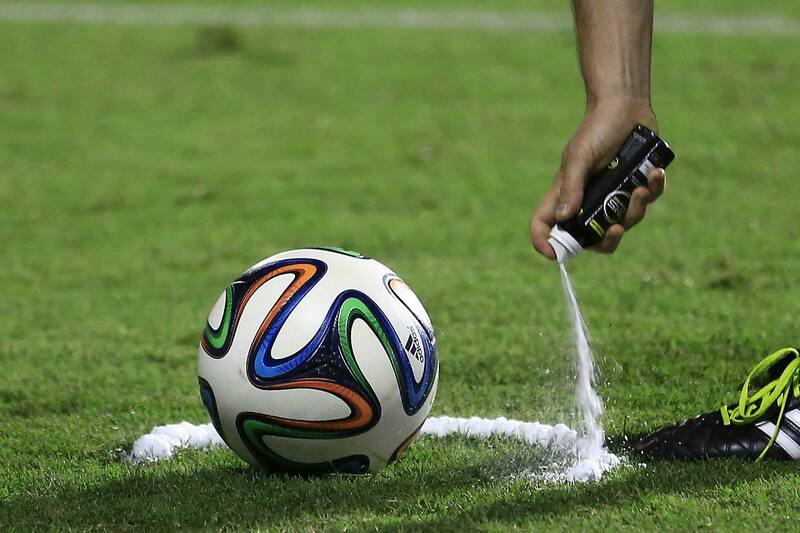 Referees will use vanishing spray during 2014 World Cup to stop defensive walls creeping forward at free-kicks. The international soccer tournament is set to begin in a few days, with Brazil and Croatia competing in the opening match on June 12. 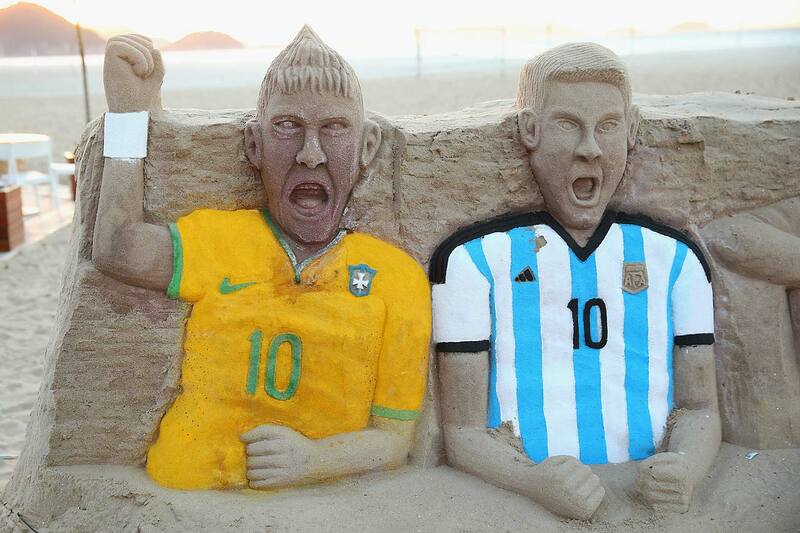 A sandcastle of Neymar of Brazil and Lionel Messi of Argentina on Copacabana beach on June 9 in Rio de Janeiro, Brazil. 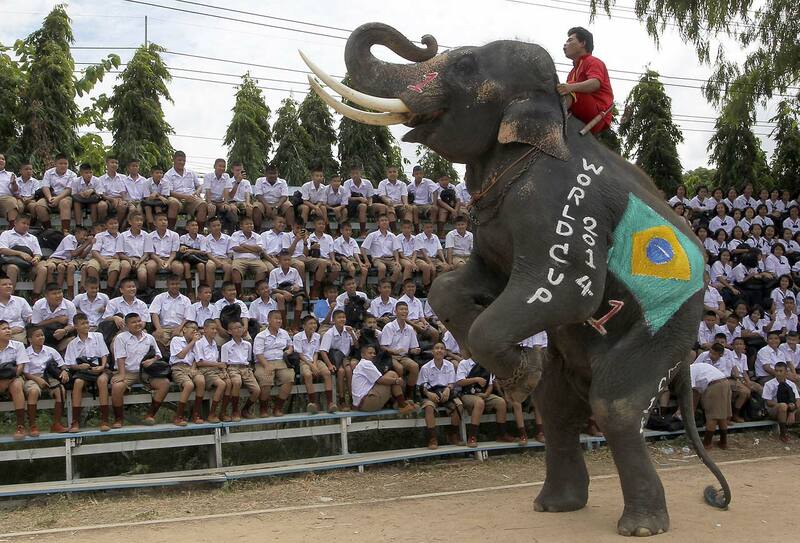 A Thai mahout guides his elephant to entertain school children during the break at a soccer match between men and elephants to celebrate the 2014 FIFA World Cup Brazil organized by Ayutthaya Elephant Camp in Ayutthaya province, central Thailand Monday, June 9, 2014. 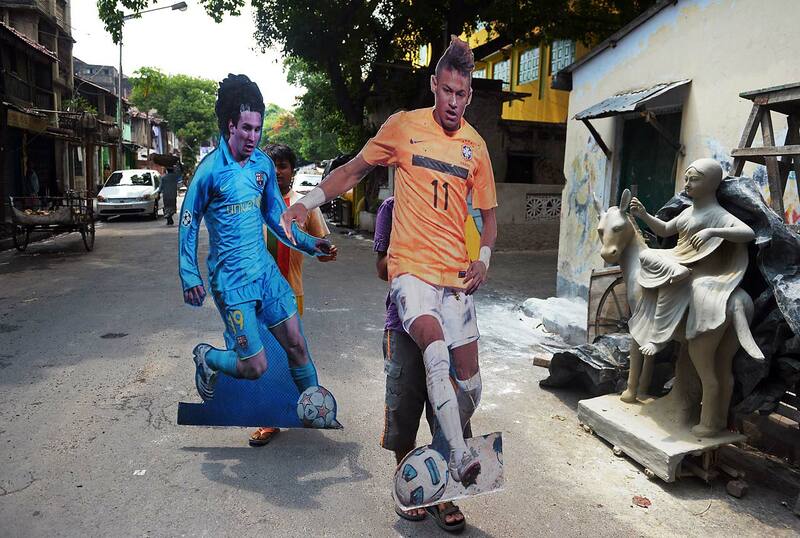 Indian footballers carry cutout portraits of Brazilian soccer player Neymar (right) and Argentine soccer player Lionel Messi to a football club in Kolkata on June 9, 2014. Football fans in the eastern Indian city are gearing up for the upcoming Brazil FIFA World Cup 2014 and decorating their clubs with football-related paraphernalia. 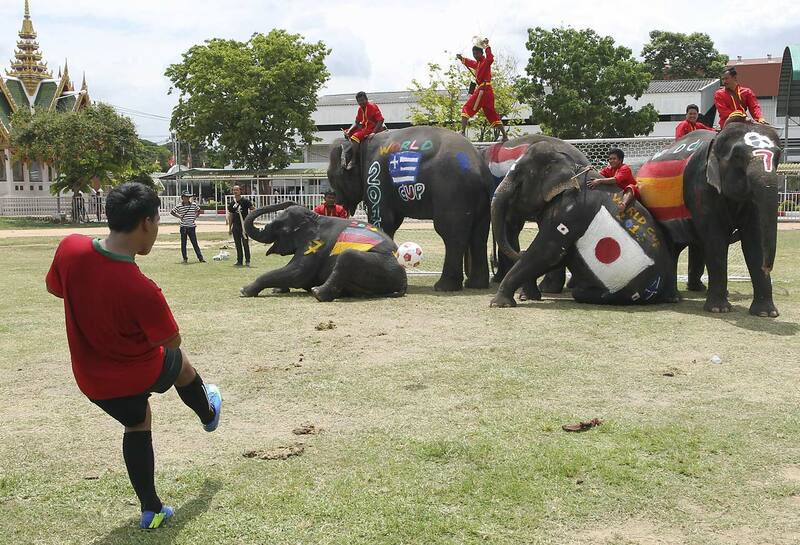 A Thai youth kicks the ball as five elephants block the goal during a soccer match between men and elephants on Monday, June 9, organized by Ayutthaya Elephant Camp to celebrate the World Cup soccer tournament.